Peter Kinloch on the summit of Mount Everest (David O'Brien). 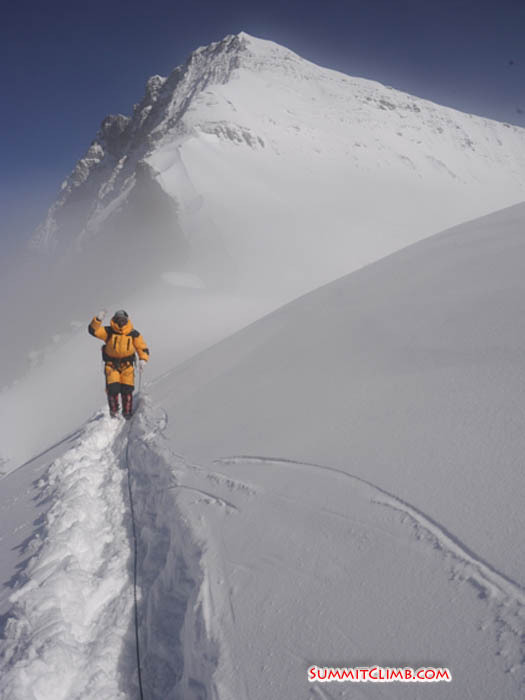 John Kazanas climbing up to North col at 6900 metres, (www.reachyoureverest.com). 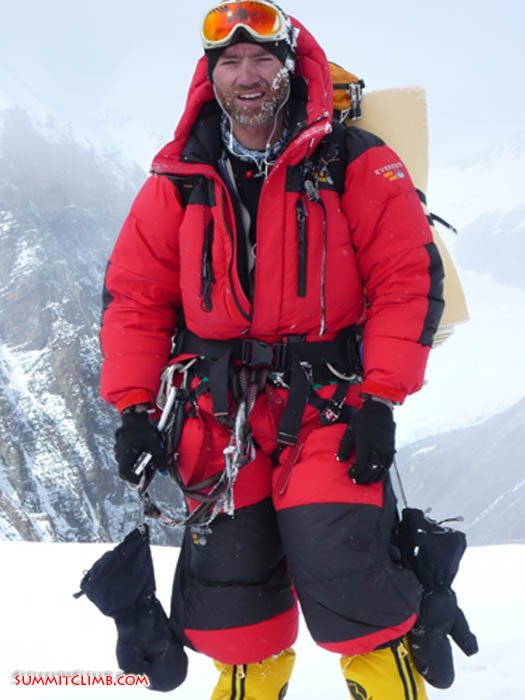 John Kazanas on the summit, May 25, 12pm, (www.reachyoureverest.com). Naked Jangbu Sherpa on the sumit, 25 May, 12pm, (John Kazanas, www.reachyoureverest.com). Thorbjorn ensuring VIP tickets (David O'Brien). 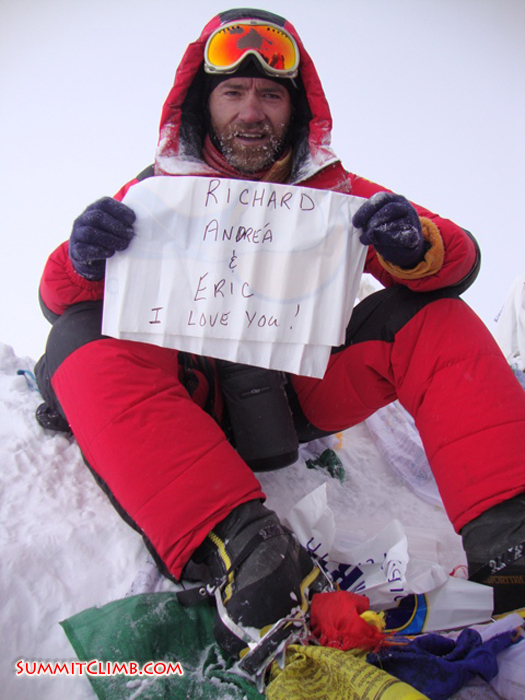 From l-r: Elizabeth Tertil, Peter Kinloch and Enrique Rodriguez on the summit of Mount Everest. For Elizabeth and Enrique, this was their final step to completing the 7 summits. Congratulations! (Elizabeth Tertil). 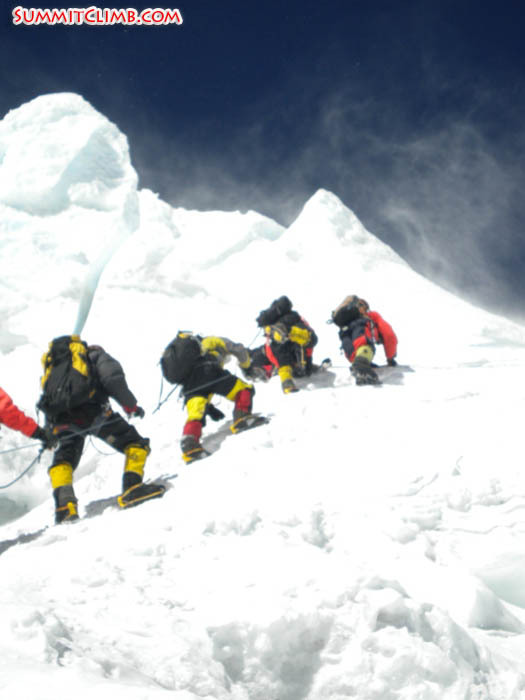 View our links for more information about our upcoming Everest Tibet, Lhotse and Everest Nepal expeditions. We are now accepting applications for the spring of 2011, so please join us for Everest, Lhotse, Cho Oyu and our treks and trekking peaks. 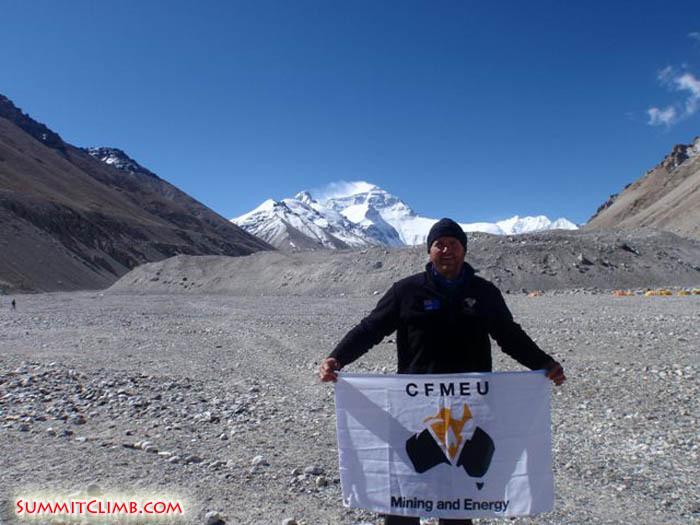 Hi, this is Dan calling in a dispatch for the 26th and 27th of May for the SummitClimb Everest Tibet team. I tried to make an earlier dispatch, but was interrupted by some kindly people coming near my tent trying to sell Cokes or something in the early morning hours. I’m calling in this dispatch from 6400 metre/21,000 foot advanced basecamp. We had a very long summit day, which for some didn’t finish until even the early morning hours of the 26th of May. It was extremely difficult and challenging and even sad. The team was exhausted in the morning. They slept in a bit up there in the high camp 3 at 8300 metres/27,200 feet. Then they packed up their things and tried to clean up the camp. The camp looked like an enourmous car park on an early Morning after a busy car-boot sale all Saturday and Sunday. So basically camp 3 was trashed. We got some more oxygen for the members and the sherpas, who were very tired. We had to carry all of our things down the mountain. We left in the afternoon from camp 3 and hiked through every kind of weather you could imagine, except for rain of course. It was beautiful and sunny at times with amazing views while we skirted around the vast Himalayan ridges above camp 2 and traversed the big faces. Wind came in and a blizzard started blowing. We made it down to camp 2, which was completely abandoned. 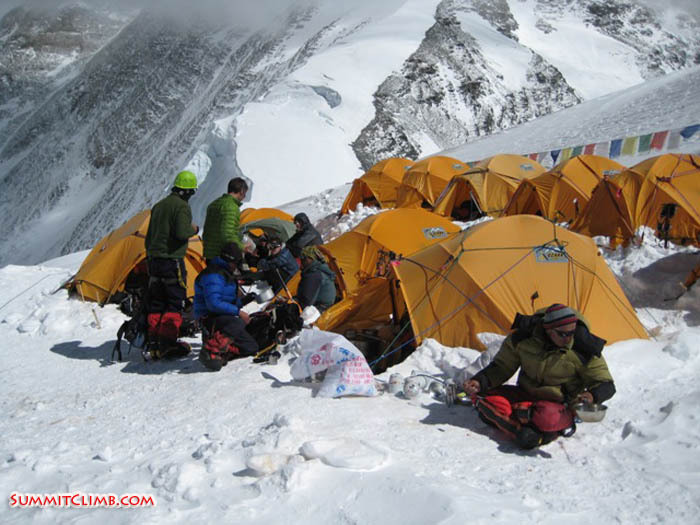 All of our tents and equipment had been removed by our sherpas working busily down below. Camp 2 again looked like an enourmous car park after a car boot sale, completely trashed. In several instances we saw teams that had left their entire camp behind, including standing tents. I’ll have to say that some of our members were a bit astounded when they started calculating the value of some of this equipment that had been left up there because it was too difficult to carry down. We kept ascending through camp 2. 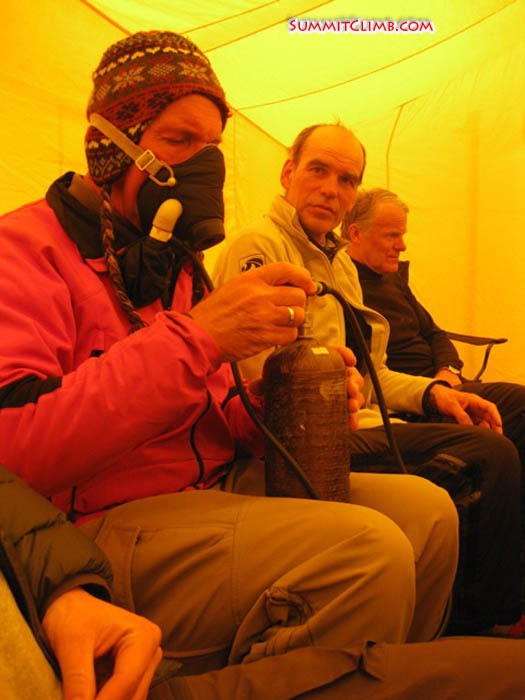 We picked up some more oxygen for those that needed it in camp 2, which our sherpas had kindly arranged to have ready for us. 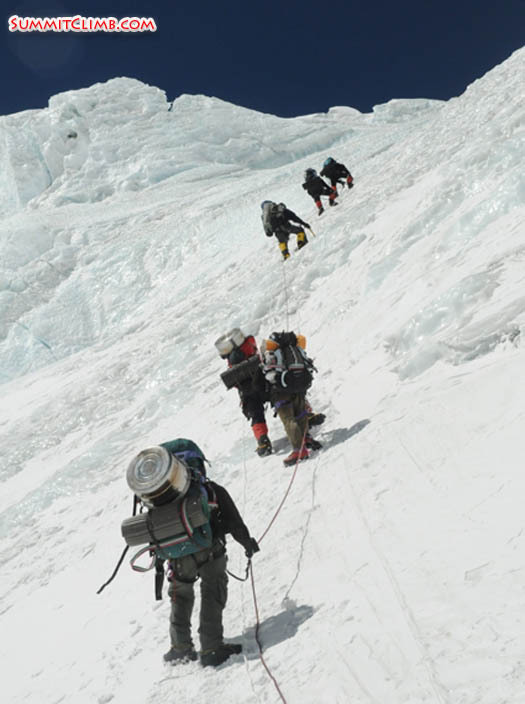 We carried on down climbing through camp 2 at 7800 metres/25,600 feet with all of us still using oxygen. It helps us feel less tired and do the work that we need to do up there, especially after a long period of time at altitude. 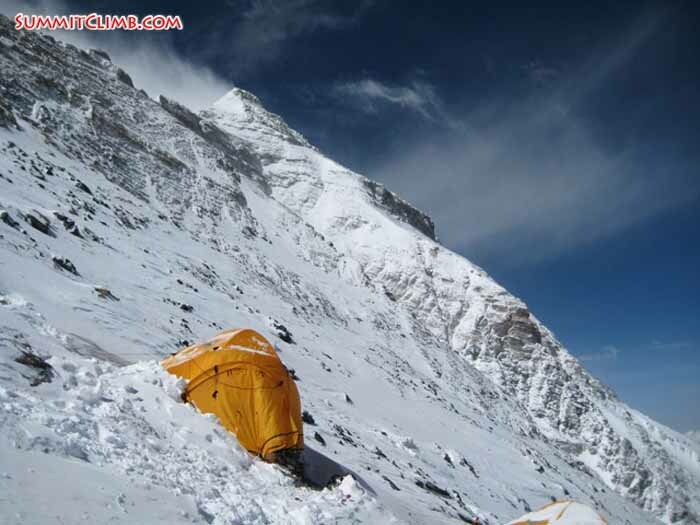 We climbed down through the night past camp 2. It was midnight and then it became the early morning hours of the 27th of May. 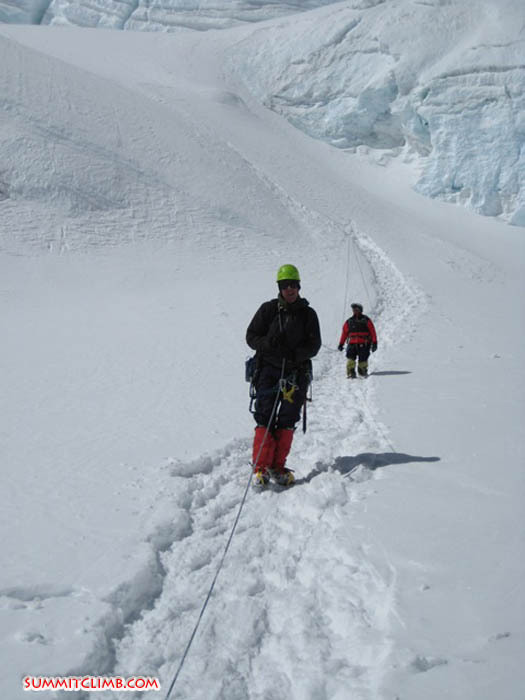 We were still cruising down camp 2 which extends in a long ridge from about 7500 metres-7800 metres. It was getting dark and then completely dark. Then a huge blizzard came up and started ripping across the ridge. It became difficult to walk. 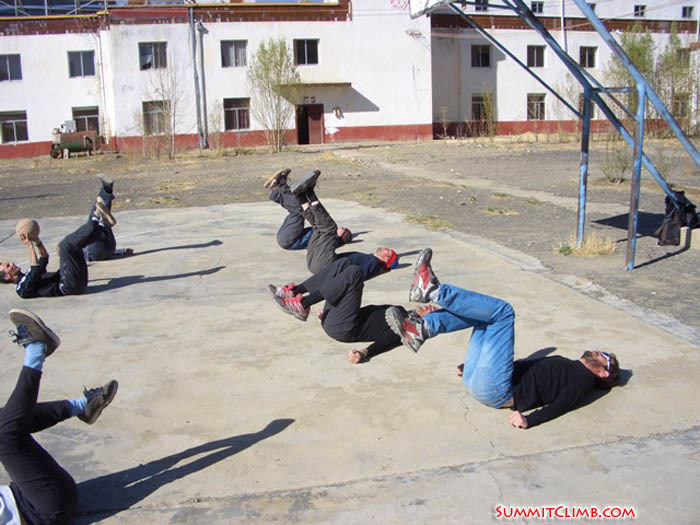 Fortunately and thankfully most of the rope had recently been replaced by the Tibetan climbing team. They had done a great job and it was really nice because the rope was getting really frayed before, so it was nice to see that brand new rope. In fact, we were sort of coming down this ridge and we hit a spot we weren’t quite familiar with. There were no tents and we were looking at this new climbing rope thinking, ‘are we on the right route because we don’t remember any climbing rope here.’ Fortunately the moon came up and the wind dropped just a little bit. We could see the moon rise over the Rongbuk mountains and Cholatse, looking out towards Pumori and Cho Oyu. We all agreed it was probably one of the most stunning views of our lives with nearly a full moon glowing across all of this. We made it down to the North Col and camp 1 at 2:00 in the morning. It was so good to be down there in the early morning hours of the 27th. Kipa, our cook, was still awake on the North Col and he was amazing. 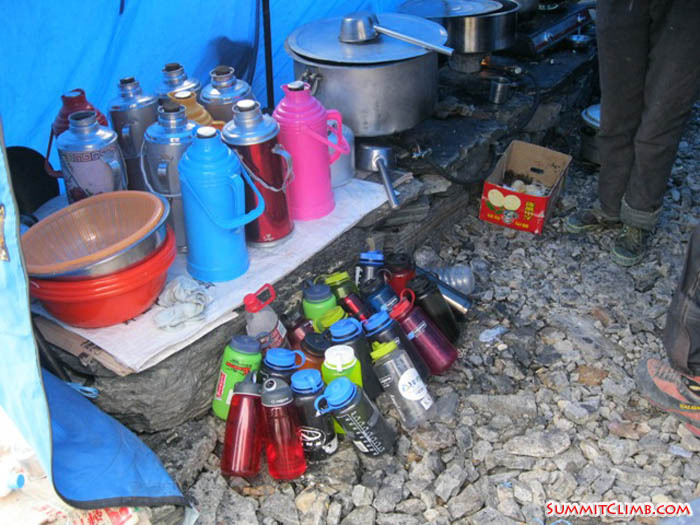 He gave us endless cups of tea, rounds of water, juice, and even prepared a light dinner. We crawled into the tents feeling like we had really accomplished something, but extremely exhausted and still stunned from the last couple of days events, feeling very humble indeed. We woke up on the morning of the 27th a little later in the morning and hung about in the tents. In fact, the sherpas had to chuck us out because they wanted to take the tents down, so at about 2:00 in the afternoon we made our final descent down the Cho La pass from the North Col face and ropes, together with our sherpas with incredibly overloaded backpacks. 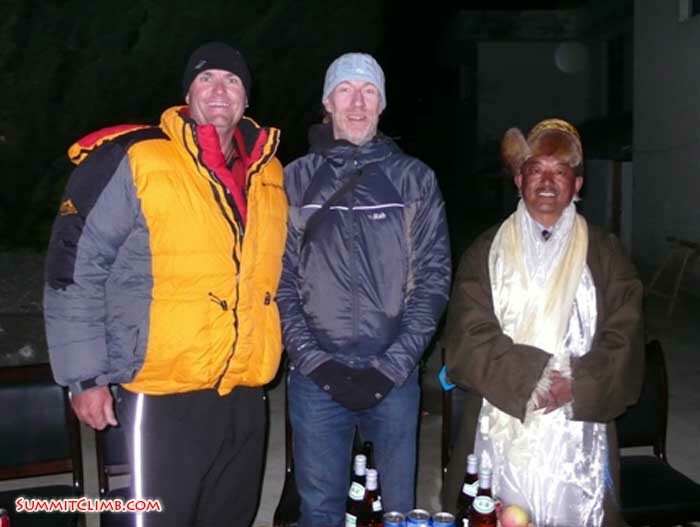 Our sherpas took such good care of us. They even wanted to carry our sleeping bags and all of our extra bits and pieces. Their backpacks were quite heavy, huge and it was very humbling to watch them. We tried to help them the whole way down. 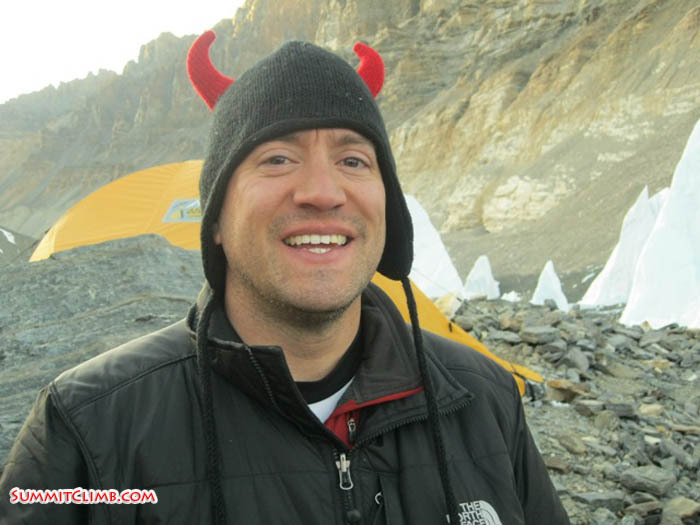 Thorbjorn reaches camp 3 (Dan Mazur). 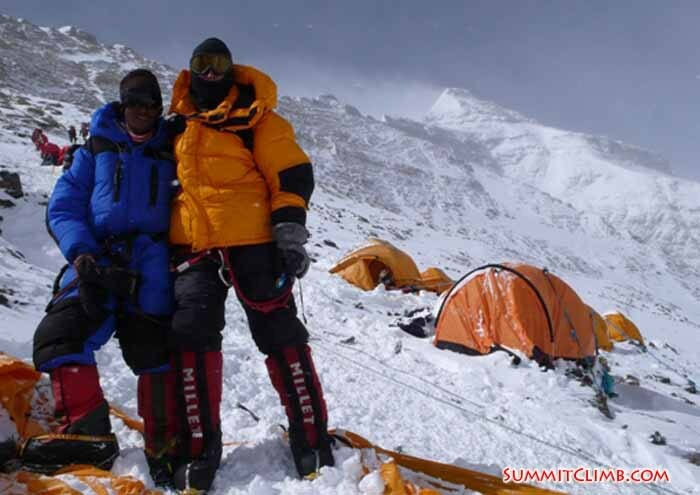 Phurba and Fiko in camp 3, summit behind (Dan Mazur). 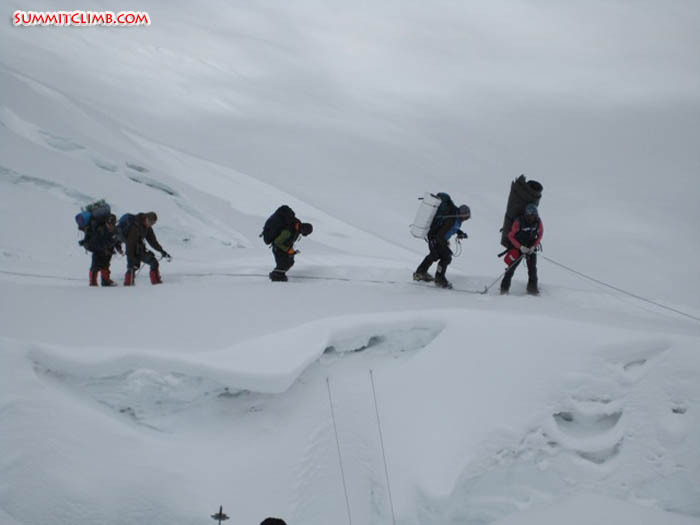 Team leaving camp 1 for the final summit push (Mark Delstanche). Team on their way up the 2nd Step (David O'Brien). 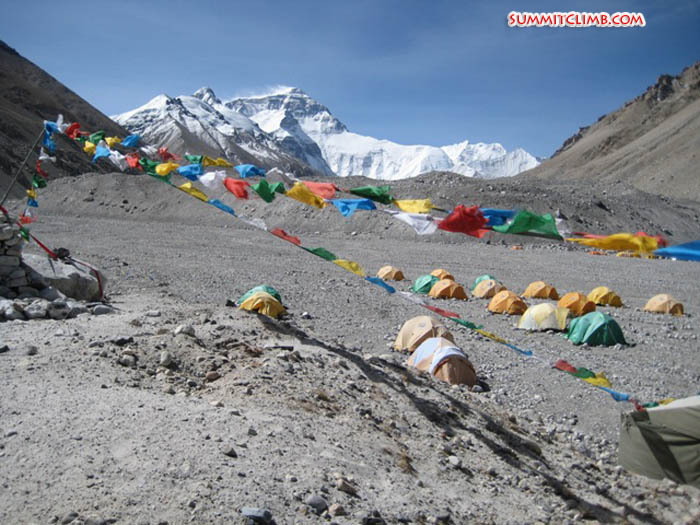 Hi, it’s the 25th of May and this is a dispatch for the Everest Tibet SummitClimb expedition. 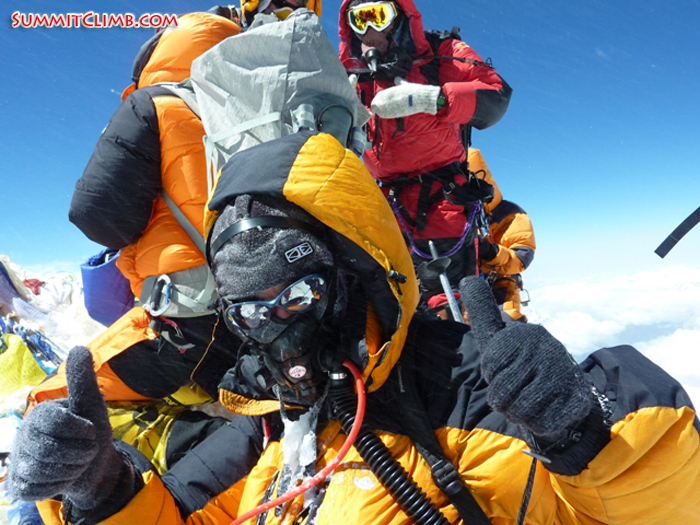 We got a call at 1:18 p.m. David was on the summit with 5 members and 4 sherpas. It was extremely windy and sunny. The other members who have been here all went down today, so everybody seems like they are doing okay so far. We will keep you posted. Thank you very much. Bye, bye. Mark and Laval on the summit (Mark Delstanche). Mark on the 2nd step (Gavin Vickers). Long reach self-portrait of David on the summit (David O'Brien). 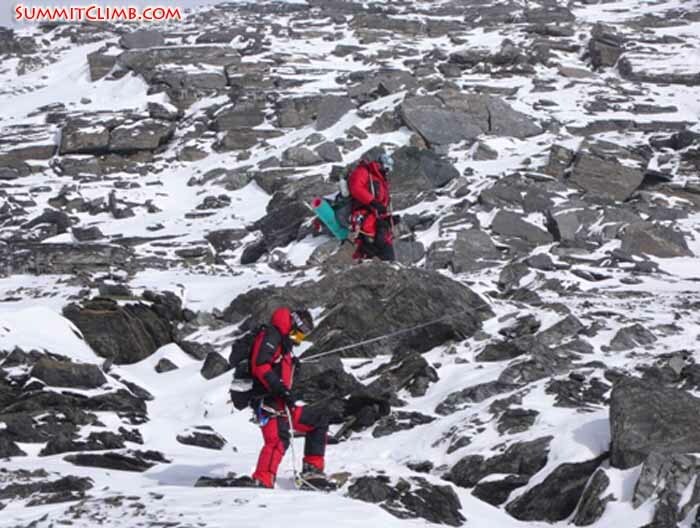 Team heading up to camp 3 (David O'Brien). Team 1 summits! Team 2 going for the summit tonight. 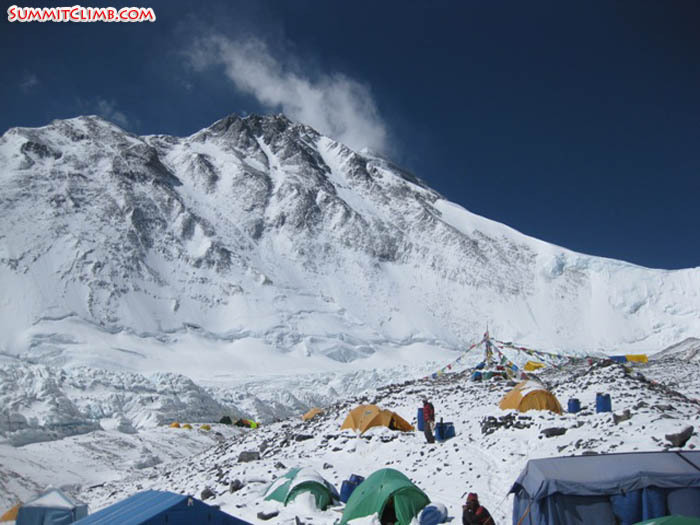 Hi, this is a dispatch for the 24th of May for the SummitClimb Everest Tibet team. It’s 7:52 p.m. Tibet time. 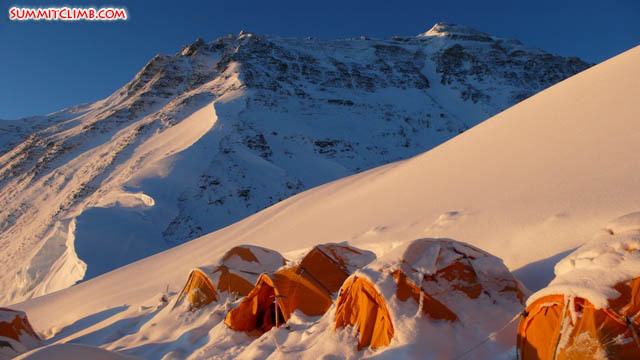 Our team is up in camp 3 at 8300 metres/27,200 feet. We’ve got some great news to report. 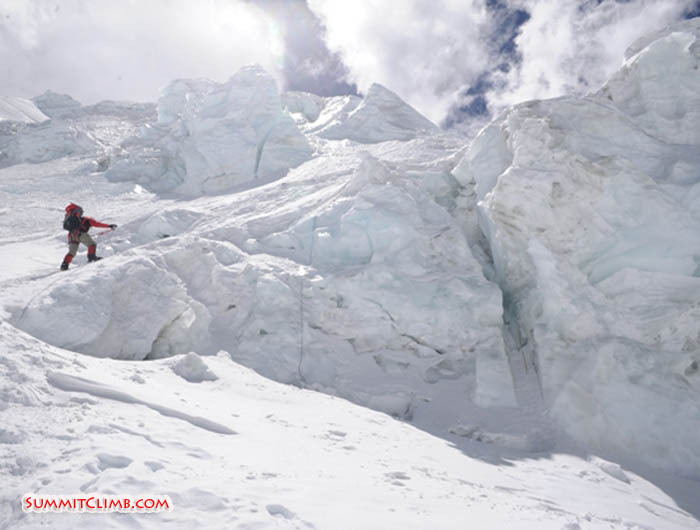 Laval, Mark, and Gavin summited in the mid-morning together with Thile Sherpa. 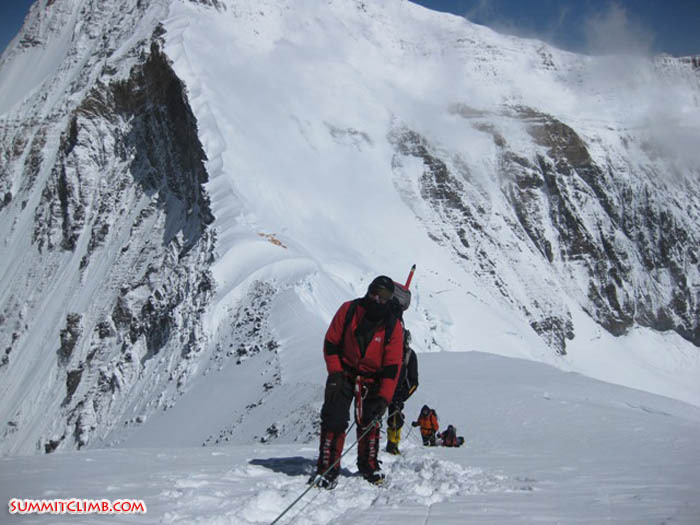 Fiko and Jangbu Sherpa summited about 1:00 p.m. in the afternoon. Everybody is down safely. 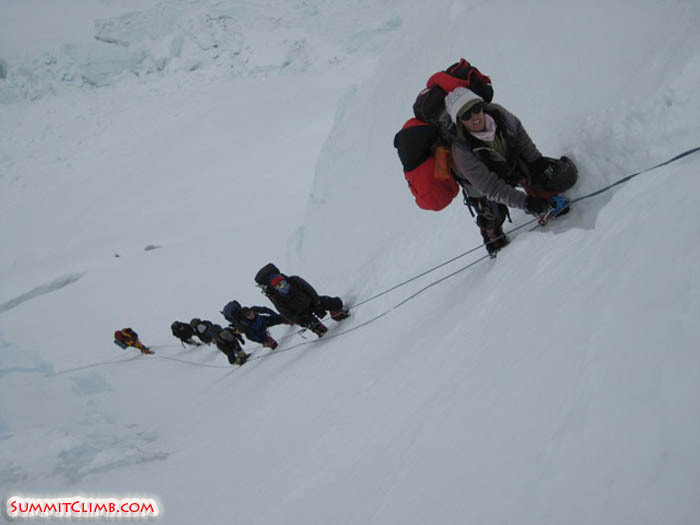 Our other group of 10 members is up in the high camp and we’re going for the summit tonight at 11:00 p.m. Tibet time. Nick is safely down in ABC. He’s doing well and we’re going to miss him. What a great guy. We’re sorry he’s not with us. Wish us all the best of luck. The weather was spotty today. There was lots of snow in the morning and it was windy. Right now the sun has popped out. It’s still fairly breezy. We can see the summit. There’s wind blowing up there, but we’re hoping the wind dies tonight in time for our big summit attempt with those 10 members and 6 sherpas. So wish us luck and we’ll keep you posted. Thank you very much. Bye, bye. Thile halfway up the 2nd step (Gavin Vickers). 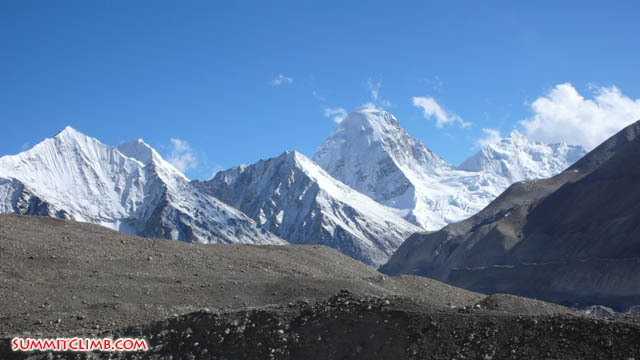 This is a dispatch for the 24th of May for the SummitClimb Everest Tibet team. I’m calling you from camp 2 around 7800 metres/25,600 feet. The current conditions are very gray skies and overcast. There are very light winds and it snowed quite a bit through the night. The temperature is pretty warm, not too bad and the time here is about 7:30 a.m. We’re just waking up. Yesterday was a tough day for our team. We climbed up from the North Col. It was a long climb up with about 800 vertical metres. 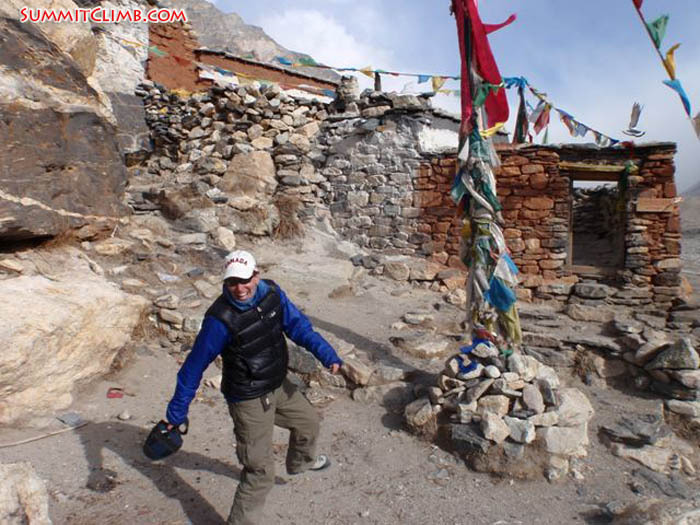 One of our members, Nick, decided that he did not want to continue so he went down with Kipa Sherpa to the North Col. I talked to him last night on the radio and he’s doing okay. 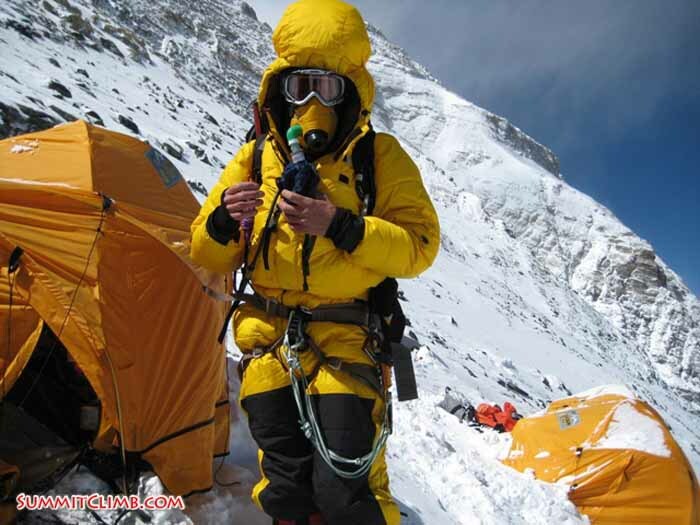 He’s down on the North Col and he plans to descend to advanced basecamp today. The rest of the team is up here. 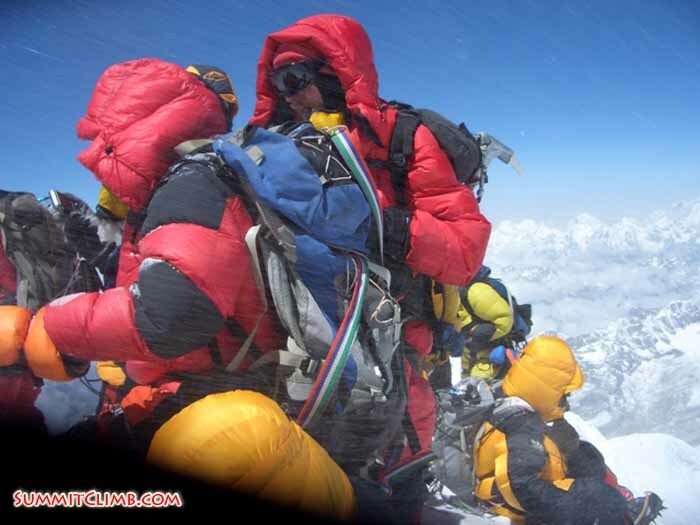 We’ve got 4 members up in the high camp together with 2 sherpas. They tried for the summit last night. We haven’t heard the outcome of their summit attempt yet. I did have the radio on all night and I did here some communication between the team members and sherpas, including a radio call saying they had reached the 2nd step. I haven’t heard any other radio calls since then, but we’re listening and waiting for them to call in. As soon as they do, we’ll let you know. 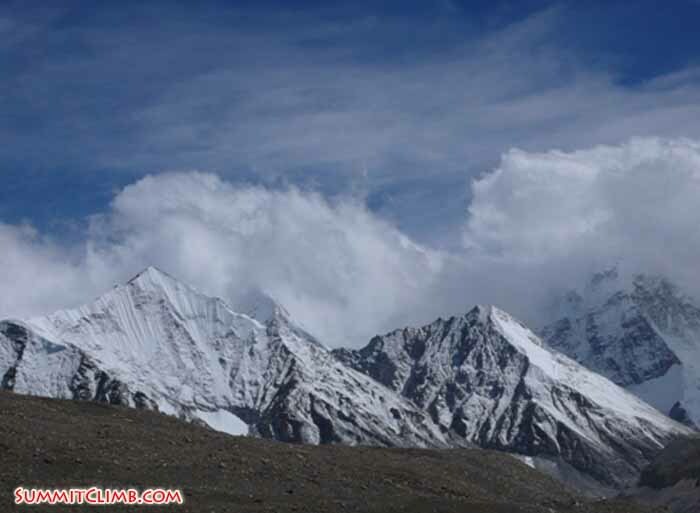 Our team plans to go up to the high camp today, weather permitting. It’s been pretty busy on this side of the mountain during this weather window. 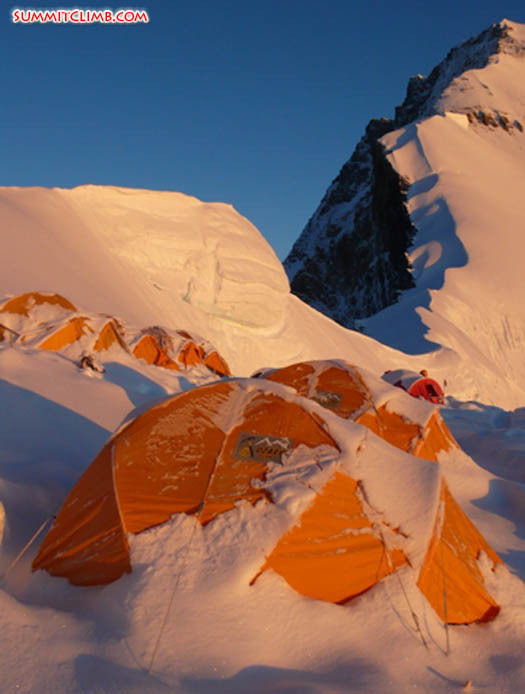 Yesterday our team of 4 members and 2 sherpas called in to say that there weren’t any tent sites available. They discussed with some of the other teams up there the situation who were kind enough to let them use their tents, so they didn’t have to put up any tents. So that’s good. In exchange, some of the other teams asked if they could give some of their members to us so we can help them reach the top on their 2nd summit bid. Apparently some of their members were trying to get to the summit, reached the 2nd step, went for their fresh bottle of oxygen and realized the bottle was empty. So they had to go back down. Can you imagine that? I do recall our local Kathmandu agent checking all of the bottles for us, so hopefully all of our oxygen bottles have oxygen in them. We’ll keep you informed as things progress up here. We wish all of team members and sherpas the best of luck. Also we also wish all of the other teams the best of luck as well. 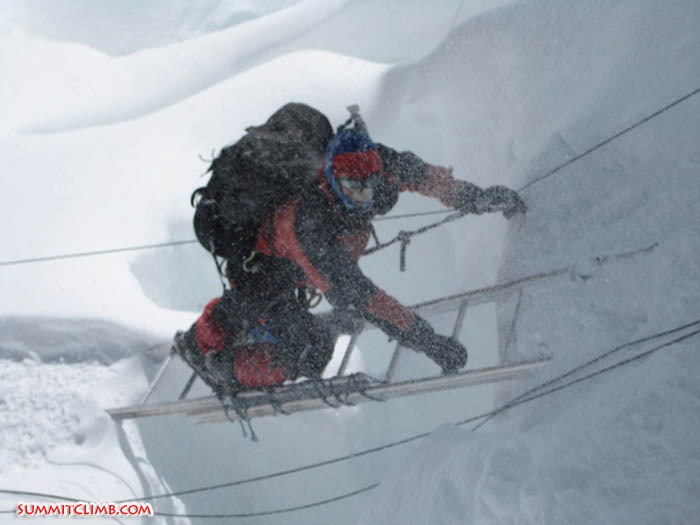 Big storm blasts Pumori, scene from the miracle highway on the trek out (Dan Mazur). Camp 3 with the summit behind (Frank Irnich). Frank at camp 3 (Peter Kinloch). Looking down at camp 3 from above. snowy Khumbu valley, Pumori, and Cho Oyu behind (Dan Mazur). 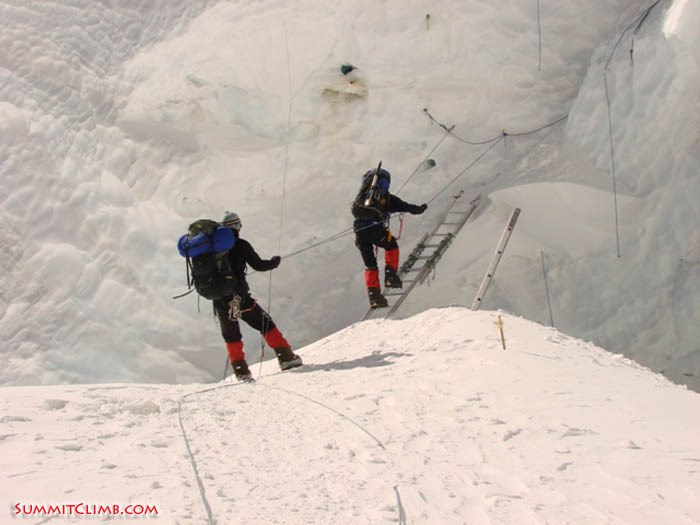 Thorbjorn and David descending into camp 2 (Dan Mazur). Thorbjorn climbing up to camp 2 with the North Col in the background (Dan Mazur). Hello. 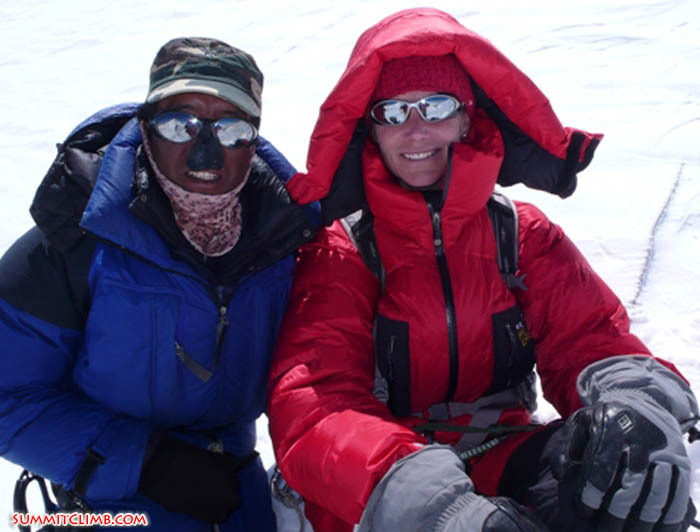 Today is May 22nd and this is Elizabeth Tertil reporting from the North Col for the SummitClimb Everest Tibet expedition. Today is the first day of our final push for the summit. We have been divided into 2 groups. 4 of our members are already in camp 2. 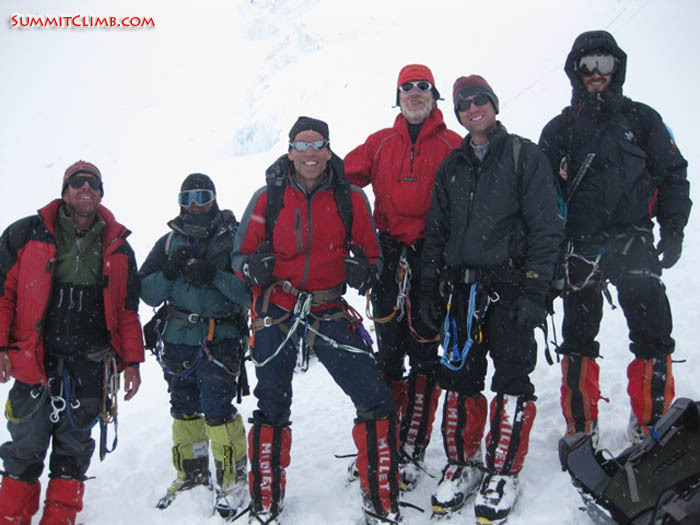 That would be Mark, Laval, Gavin and Fiko with a couple of sherpas. The majority of our group is at the North Col. We arrived today safely. It’s a beautiful day. There is no wind, it’s sunny and warm. All of the members, staff, sherpas and cooks seems to be in very good spirits. Tomorrow we are planning to go to camp 2. Unfortunately this year camp 2 is quite high. Therefore we are going to have to gain a significant amount of elevation, which is quite hard at this altitude. Some of our members will be going on oxygen, but of course that is a personal choice. Unfortunately one of our members, Eli Hall, had to go down because he wasn’t feeling very well. He will be missed by all of us. Our plan after camp we reach camp 2 tomorrow is to go to camp 3, which will be a much shorter day. Finally on the night of the 24th, we will begin our final push for the summit, so we will be summiting on the morning of May 25th. It appears that we have a nice weather window with the full moon being on the 27th. It kind of seems that the weather is always more stable around the full moon. It’s been very quiet with no wind for the past 24 hours and relative warmth, so we are all keeping our fingers crossed hoping that we will have a beautiful summit morning. 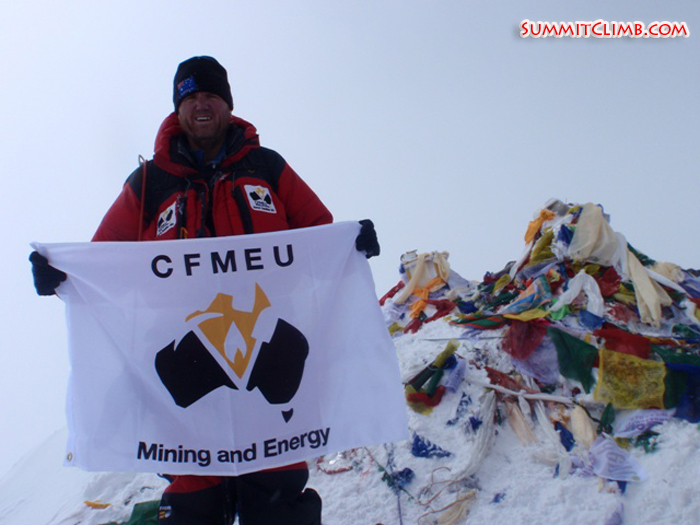 Gavin Vickers on the summit of Mt Everest. 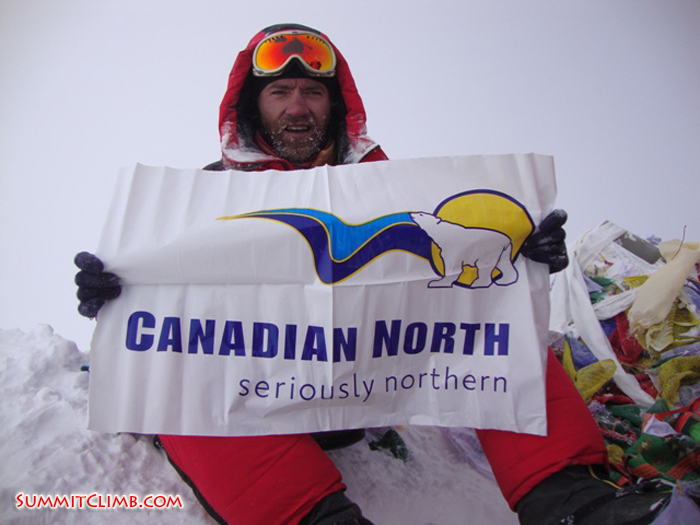 Laval with his airlines flag on summit (Mark Delstanche). Laval with his family names on paper on summit (Mark Delstanche). 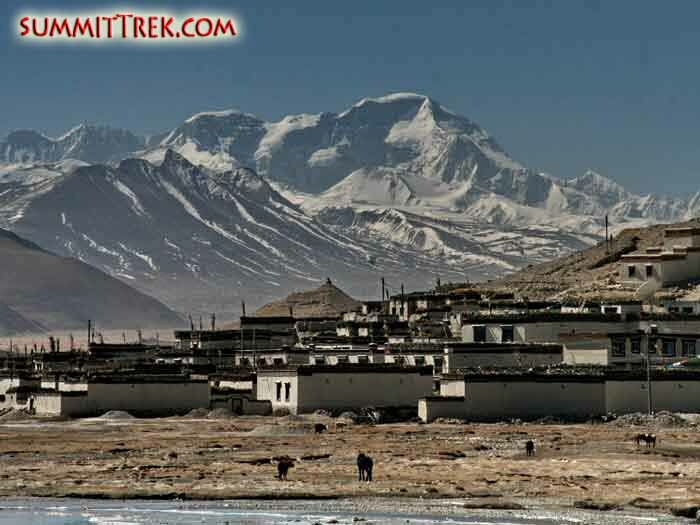 This is a dispatch for the 20th of May for the SummitClimb Everest Tibet expedition. It has been a very difficult and challenging last few days for our team. 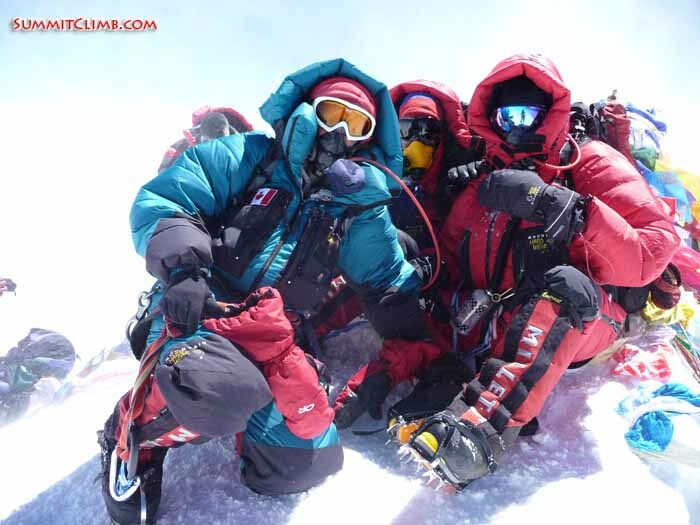 We’d like to congratulate the Tibetan and Chinese team for fixing the route to the summit of Mount Everest and for getting a lot of their members on the top safely. Job well done! Thank you very much. Some other teams also summited. We heard some Taiwanese made the summit and today we met a Polish person named Magdalena who reached the summit on the 18th. Big congratulations! Also, we’d like to inform you that 5 of our members and 2 of our sherpas are on the North Col and have been there for several days. 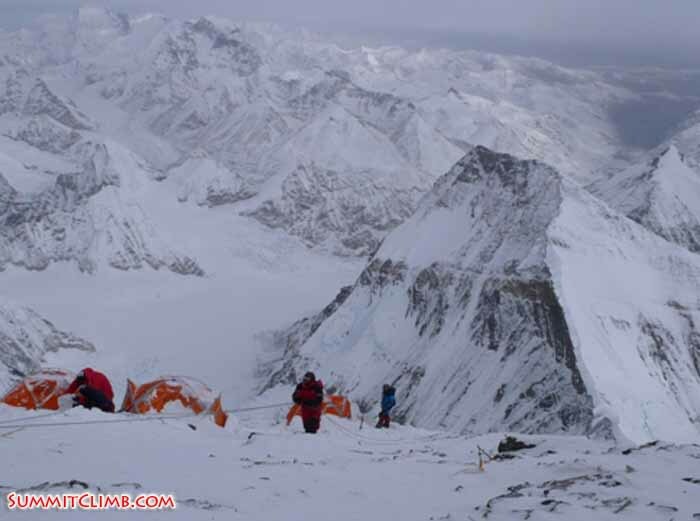 They are trying to move to camp 2, but it’s been too windy and difficult to go up. Other teams have tried to go up to camp 2 and turned around. They’re hoping they can go in the morning. The other 11 members of our team are safe and well in ABC. 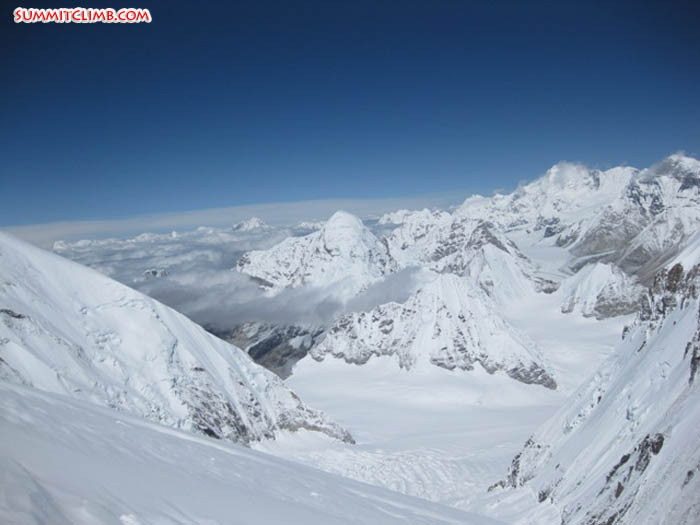 They hope to go to the North Col in the morning weather permitting and start their summit attempt, together with the remaining 8 sherpas who carried a load today up to the North Col.
We’re hoping to get some good news on the weather. We heard that the wind may drop through the 21st-25th. We’ve been checking multiple weather sources in India and Tibet and really casting about for as much weather information as we can get. It seems that the forecasts are a bit unstable, but we hope that we’ll be able to find a window so all members and sherpas can summit in safety. Big and small. Gavin and Jordan Romero (Eli Hall). Gavin showing his sponsor's flag (Laval St. Germain). 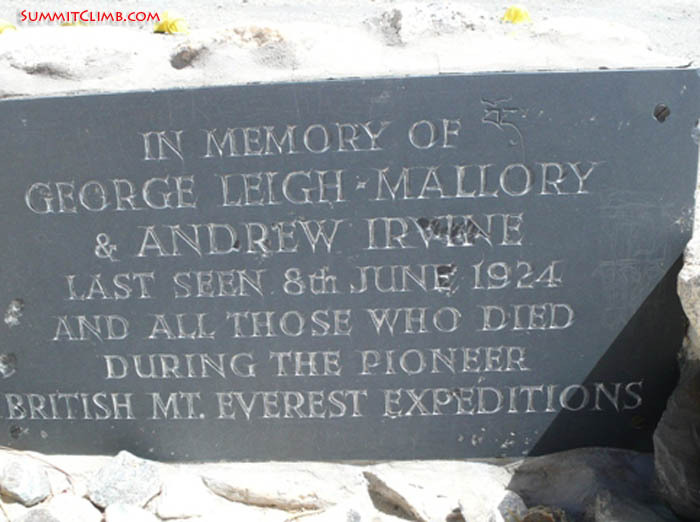 Mallory-Irvine memorial. May god rest their souls, teach us humility, and inspire us in their memory (Dan Mazur). Russian party (Gavin Vickers). 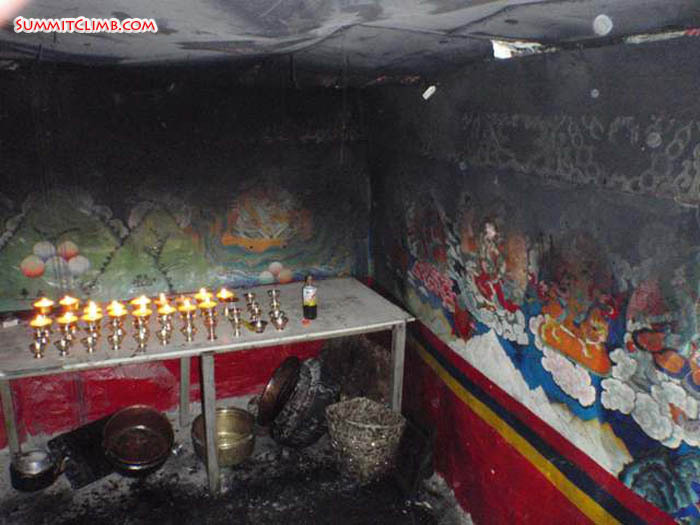 Inside the old Rongbuk Monastery (Gavin Vickers). Heather puts in a good word and a few steps for Canada at the upper Rongbuk Monastery (Gavin Vickers). The team running through aerobic exercises in Shegar (David O'Brien). 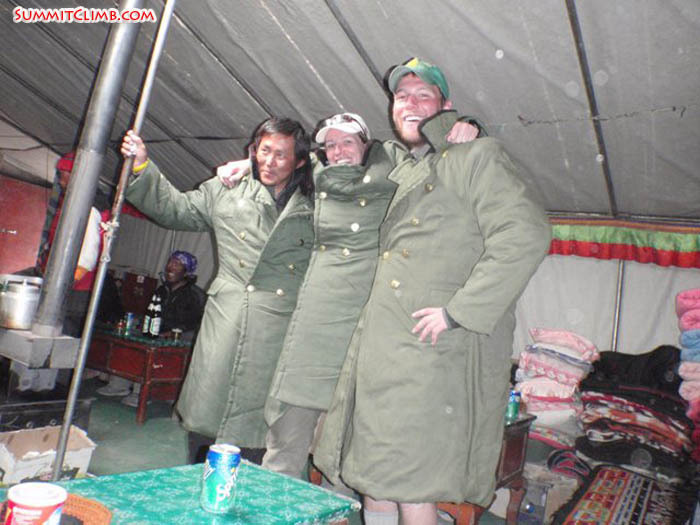 Jimba, Heather, and Max hamming for the cameras in their Chinese military uniforms (Gavin Vickers). Yes, we are still here in BC, along with all of the other teams. 5 of our members who stayed in basecamp for 10 days went up to IBC today. It may have been more out of shear boredom and frustration with staying in basecamp than for any particular reason. We aren’t really sure because the latest installment in the ongoing weather forecast saga has us all looking to the 23-24 of May as the ultimate window towards which all climbers will strive. 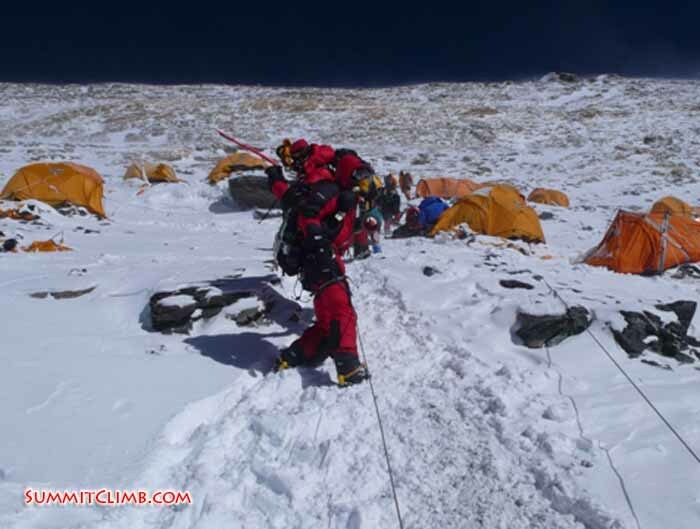 All teams are still in basecamp and want to reach the summit during this brief lull in the mighty winds which have been pummeling basecamp. In our last few days here on this 5200 metre gravelly plain, we have wandered through whipping winds and dust moats all around the place, making a point to visit most of the other teams. We popped by the Australian/South African team and 5 minutes turned into 5 hours as the stories unwound. Everyone was amazed that we could understand what they were saying and didn’t even need a translator. We invited the British team down to the teahouses and monastery, in order to sample the Tibetan version of eggs, chips, and brown sauce. Stomach teasers!!!! We popped in on the Tibetans, who seemed to have never had any visitors in their lavish dining tent, repleat with gilded carved wooden settees, upholstered benches, gold decorated sideboards, a laquerware shrine, quilted appliqué ceilings, a 3 metre stove, with a gratis snacks and drink buffet. 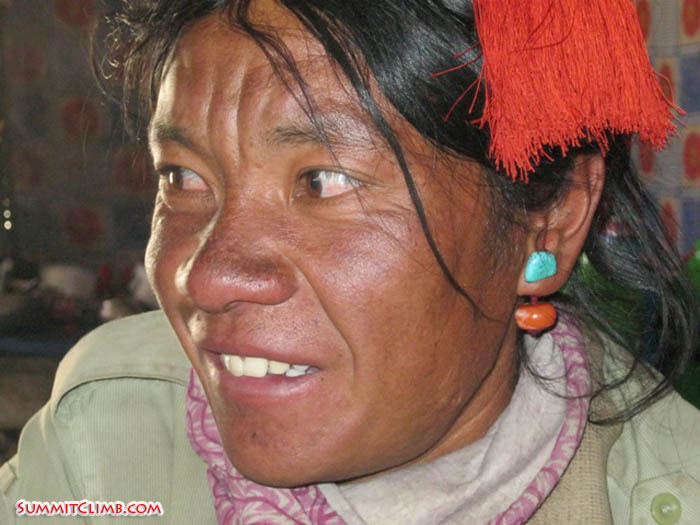 We were all stunned and amazed as the Tibetan hospitality unfolded. One guest at the party turned out to be large format photographer, and showed us his massive camera which was a massive 70cm by 70cm by 70cm box on a tripod, complete with bellows, hood, lens, and the same size film negative plates. He wants to photograph the ice pilgrims and we want to see those photos. Sounds amazing. "Ahhh the delights of Shegar: 400 count Egyptian cotton sheets, as many duvets as can be piled on the over sized beds, plump pillows and the endless hot water. Shut the door on the ensuite bathroom and run a bath with the Turkish steam effect to clean away dust filled base camp lungs. And the food, endless piles of fried chicken, chili chicken, chili cabbage, steamed buns filled with meaty delights, and Irish Stew; all cooked by a team of delightful chefs overseen by head chef Yule Brenner. Ten very skinny people eating till we could eat no more at every sitting. After the initial rest, eat, sleep, eat, eat, eat period some exercise was called for. 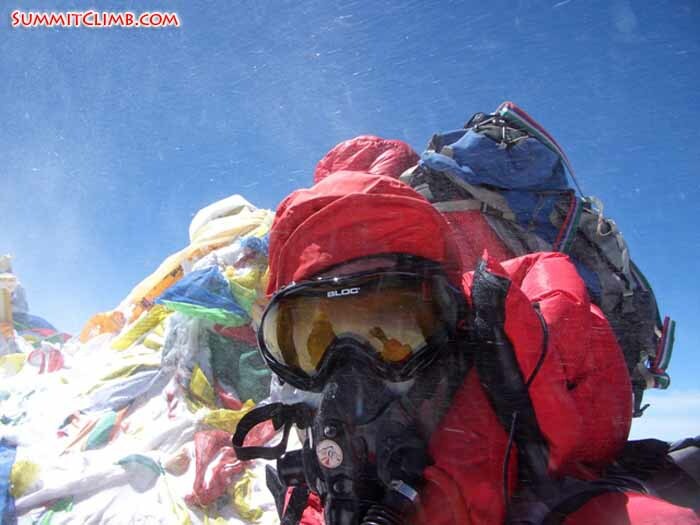 On the big Mount Everest, high winds have been buffeting the mountain since 8 May. Almost everyone has retreated to basecamp and below. Things are not looking good for an early summit this year. Much of our team is down in the village of Shegar, at 4011 metres, enjoying warm sunshine and green plants, and cotton sheets, hot showers, fresh linens, terry towels, and table cloths. Up here in 5200 metre basecamp winds keep howling and spinning around the place. Teams meet up for parties and discussions about the weather. The Russian team erected an enourmous dome tent that weighs one ton, then threw a huge party. All of the teams came over and drank all of the Russian's tea, sprite, and coca-cola, and everyone laughed and told stories and jokes into the wee hours. A ping pong championship tournament ensued and low and behold the winner is temba sherpa, the Russian's electrical engineer who keeps all of their myriad generators and lights and machines running. The British team had a birthday party for one of their members and some Australians crashed it with tasteless jokes about Eton. Dear Summit Climb News Readers. Thanks for following the news about our Mount Everest North side Climb from Tibet, as well as Advanced Basecamp Trek and North Col Climb. Hi, this is Janet Bull reporting for the SummitClimb Everest Tibet expedition on Monday morning, May 3rd. The team is back in ABC having come down from the North Col/camp 1 during a wild snow storm yesterday. Up on the North Col the wind was gusting, which means that several tents were ripped apart. One tent from another team actually flew down to the bottom of the col. This morning at ABC it is sunny and there is about 6-8 inches of new snow on the ground. Early in the day the team was treated with a view of the moon setting over the North Col. It was very beautiful. Hopefully in a day or 2 we will again return to the North Col and pick up where we left off, trying to progress to camp 2. Overall everyone is well. 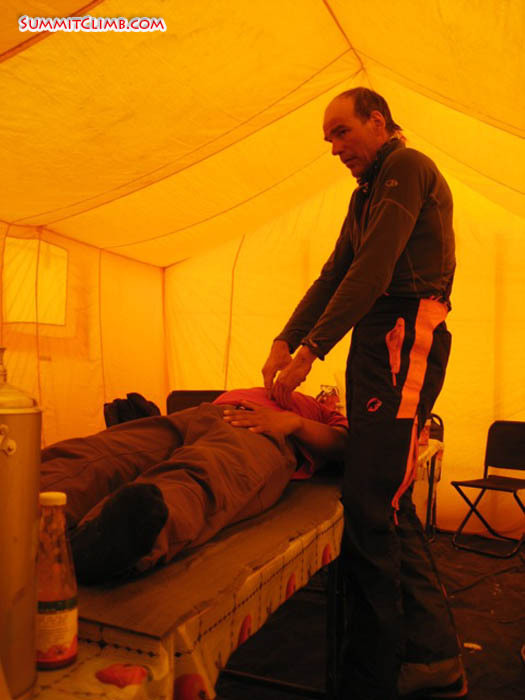 Frank Irnich, physiotherapist, massaging torso of Jangbu Sherpa, who had been complaining of pain in legs and who we thought might have pinched nerve(Peter Kinloch). Practicing with O2 equipment in ABC. From left to right, Fiko, Frank, and Gordon (Peter Kinloch). 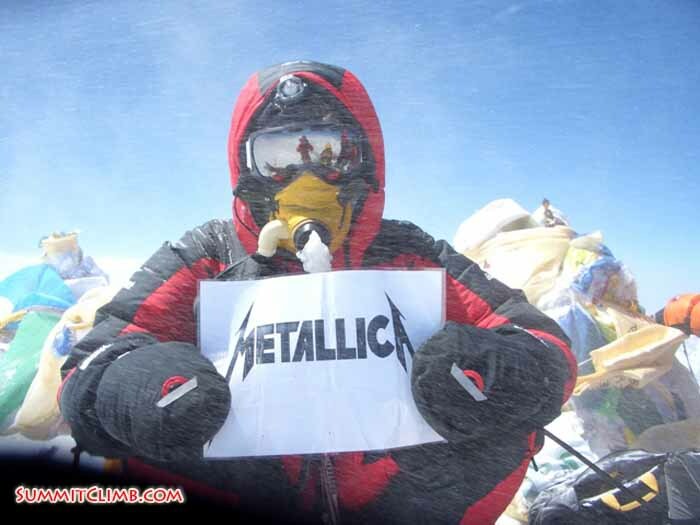 Hi, this is Nick Crosland calling in for the Everest Tibet expedition from the North Col at 7000 metres/23,000 feet. Today is May 1st and it’s 8:00 p.m.
We have staggered the group slightly because camp 2 can only have 6 tents at the current moment. We had 4 members come up to the North Col on the 29th, 6 on the 30th, and the remaining 5 came up on the 1st. The weather has been excellent so far. We’ve had a little wind and snow. The route is slightly different due to the avalanche and is more difficult, but seems easier because it’s our 2nd time coming up here. We’ve had one member make it up to camp 2 on the 30th, Laval. Unfortunately, Eli, who had the stove, wasn’t able to make it up, so Laval was a bit dehydrated and came back down today. We had 2 more members go to camp 2 today and tomorrow 5 more will go up. The remaining will go up the following day and hopefully sleep there a day or 2 and hike up to camp 3, depending on how everyone feels. The food here has been excellent thanks to our awesome cook, Kipa Sherpa. We’ve had delicious noodles, chicken and all kinds of tasty things that have kept up everyone’s moral. 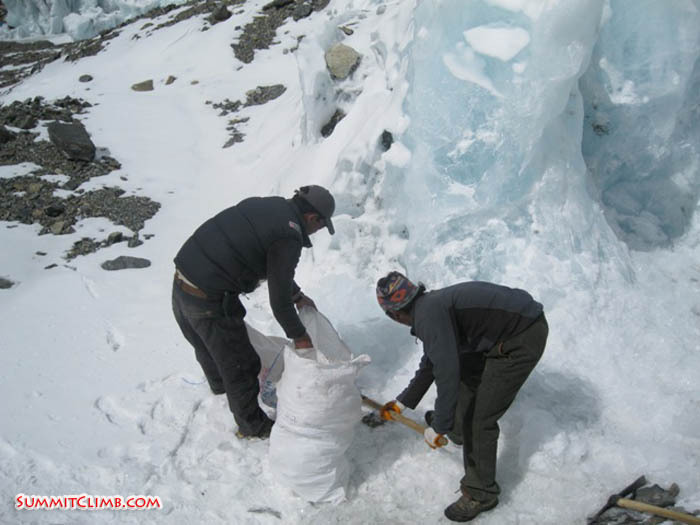 Sherpa team digging tent platforms on the North-col (Chang-la) at 7000 metre high camp 1 (Fikret (Fiko) Karacic). 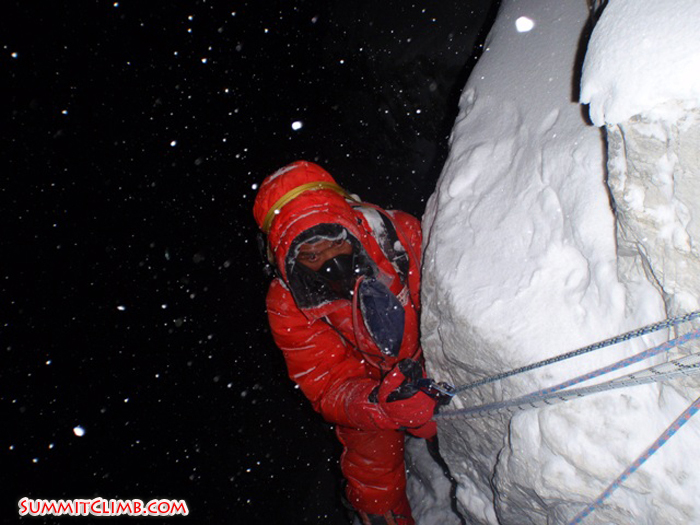 Team member Fiko at 6900 metres on the Nnorth-col (Chang-la) face, traversing a crevassed section, on the way to camp 1 (Gordon Hopper). 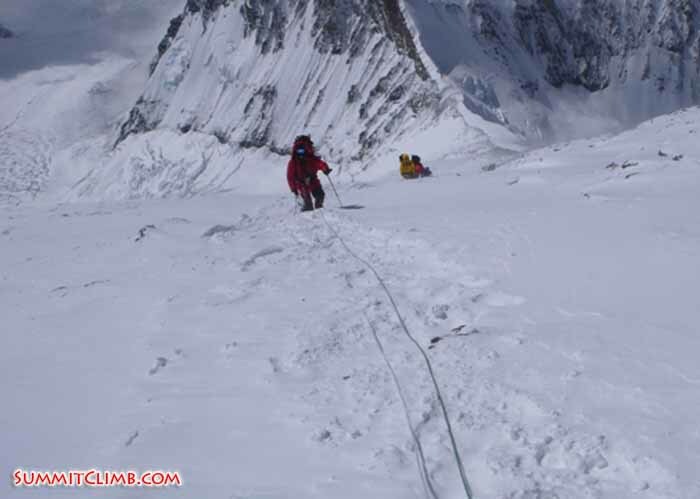 Jangbu Sherpa on the second to last pitch, coming down to the flats at about 6600 metres (Frank Irnich). 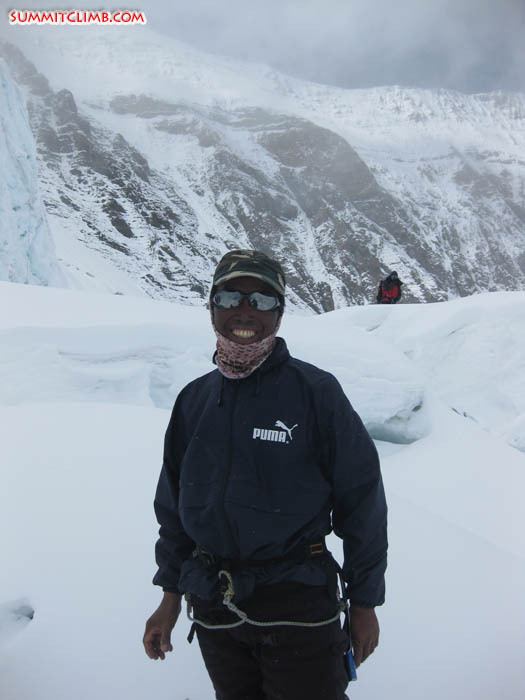 Pasang Sherpa having a happy moment near 'Nick's crevasse' at 6800 metres (Peter Kinloch). 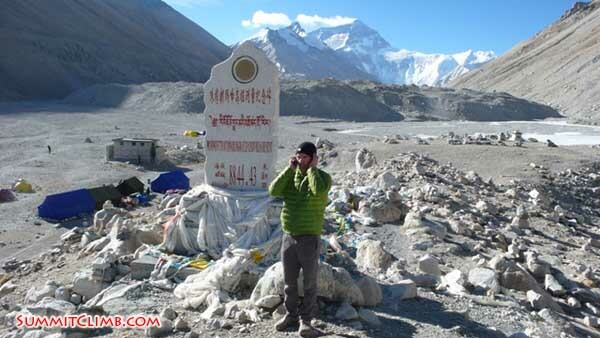 Hi, this is Dan Mazur the leader for the SummitClimb Everest Tibet expedition with a dispatch for the 29th of April. The team is all comfortable in ABC. 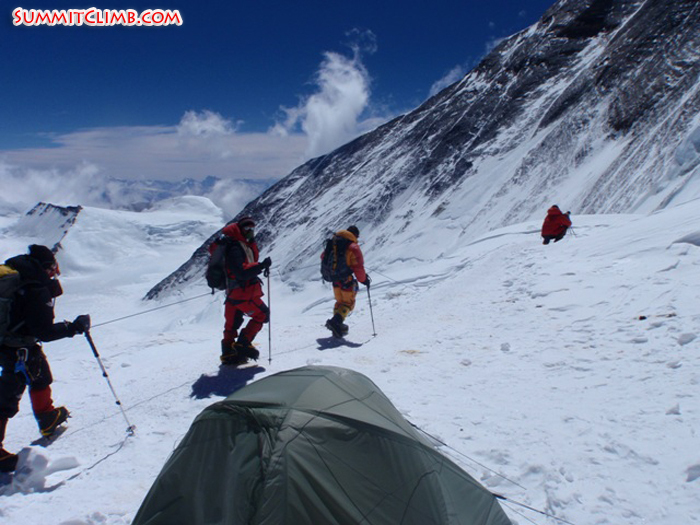 4 members went up to the North Col to get a head start on acclimatization trips to camp 2. 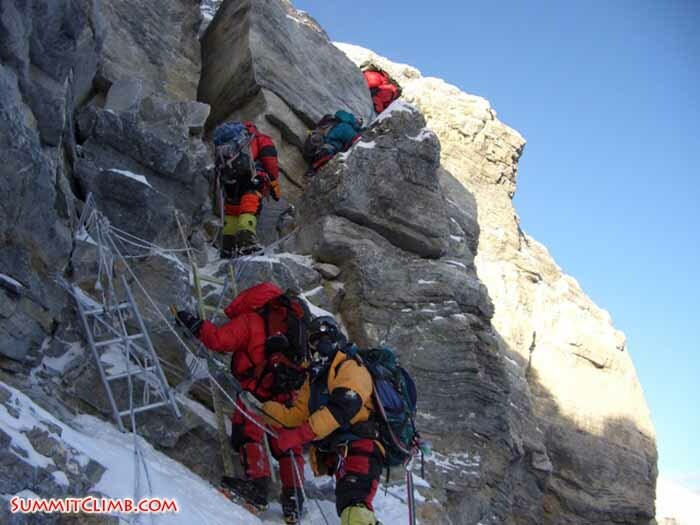 Our sherpas have carried many loads up there. We’ve got lots of oxygen, food, epi gas, stoves, equipment and everything up there. Things are looking good. The weather’s been great. We had a little snow last night, but today the weather has been really perfect. There’s not much wind. It’s warm and there are a few puffy clouds. We’d like to say best of luck to Jesse Hall and Dan Marino who left our trip and we’re really going to miss them. They are a couple of great guys and we’re sorry that they’re no longer with us. They’ve gone back to Kathmandu. 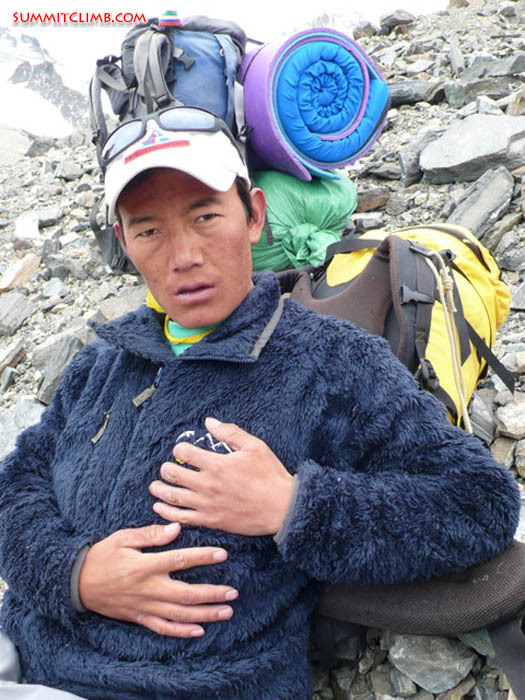 In addition, we located Lopsang, the Tibetan climber out on the glacier yesterday at 6200 metres and he called Sweden to the summit climbers he was with on Everest in 2006 when he froze his fingers. That was Martin Letzter and Olaf Sundström. They have generously sent funds to Lopsang as kind of a summit bonus and also to show their regret that he froze his fingers. So we passed Losang the very generous amount of money that Martin and Olaf gave yesterday. 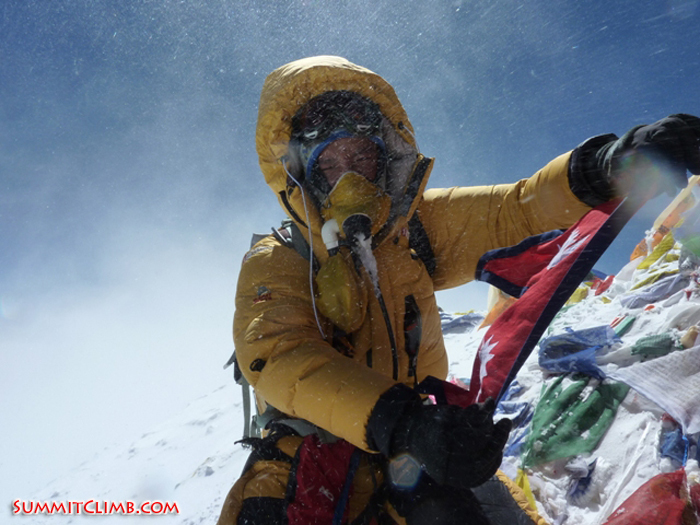 We took some photos and, as one of his Tibetan climbing colleagues said, it was Lopsang’s lucky day yesterday. We’re all up here resting and hopefully all of us are going to go for the North Col tomorrow and on up to camp 2. We’ll spend a couple of nights and get acclimatized. Our sherpas have been working so hard and have really impressed the group we have this year. Our Chinese leader, Asu, has gone down to Tingri. 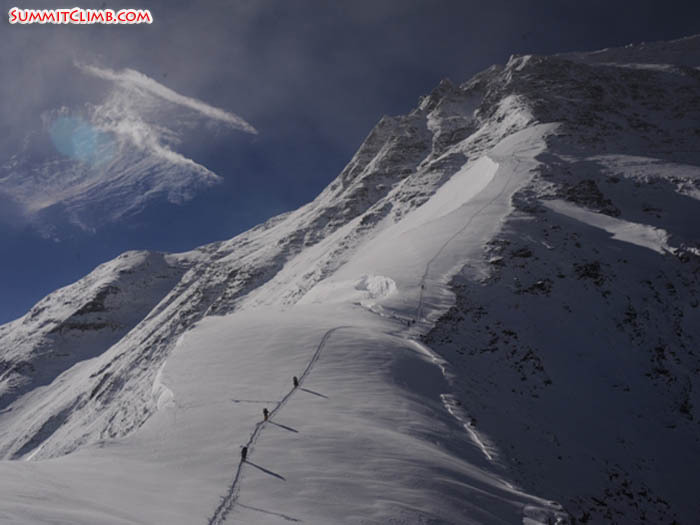 He’s going to meet the Nroth Col team and the Everest ABC trekkers and slowly help them come up to basecamp, ABC, and on to the North Col.
Another update we have is the route to the North Col has been moved and climbs away from the original spot where there was the tragedy a few days ago. 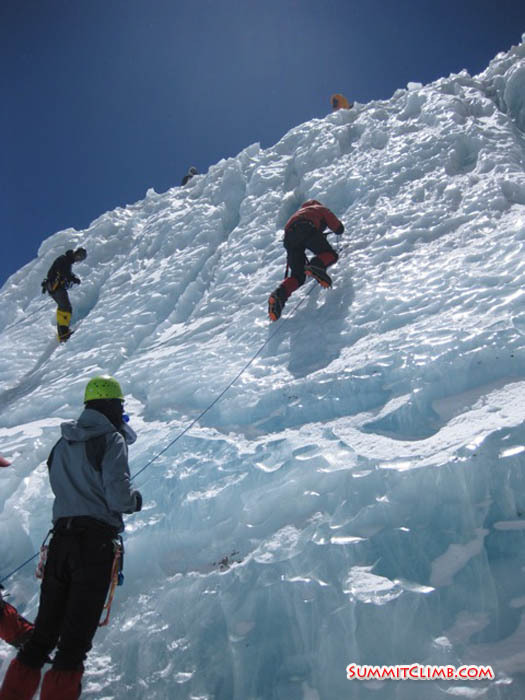 Some ice fell down and there was a horrible accident, so it’s really good that the Tibetan climbers have moved the route. 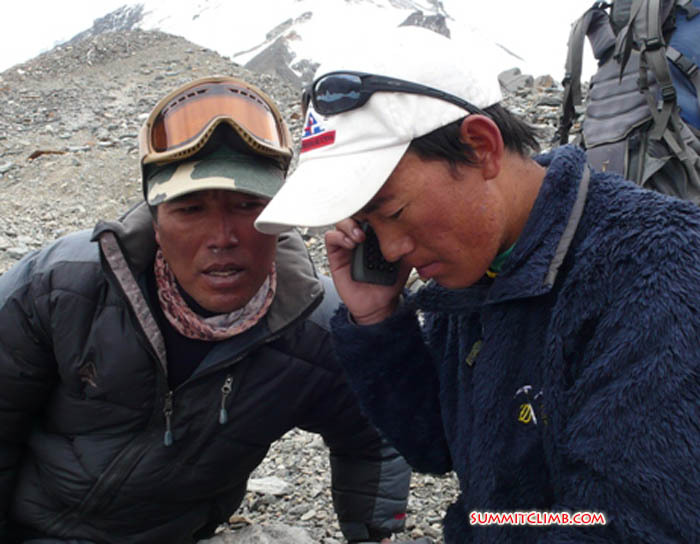 Psang and Lobsang (left) at 6200 metres telephoning Martin Letzter in Sweden (Dan Mazur). Pumori, Khumbu Valley, Lingtren, Khumbutse, and Lho-la, seen from above (Peter Kinloch). 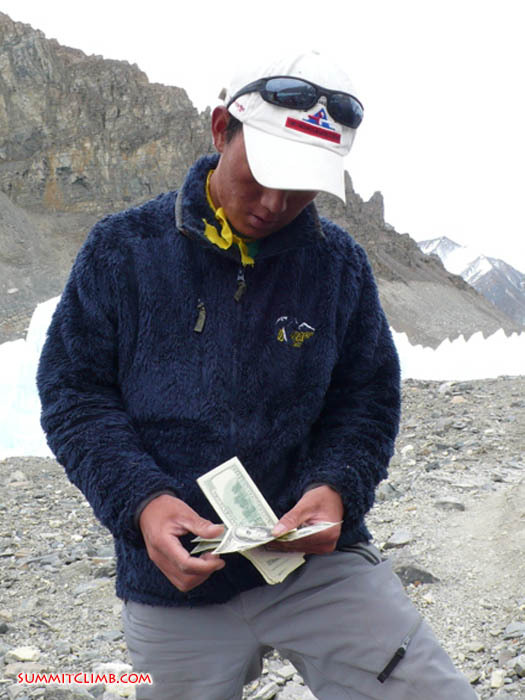 Lobsang counting his summit bonus payed by Martin Letzter (Dan Mazur). 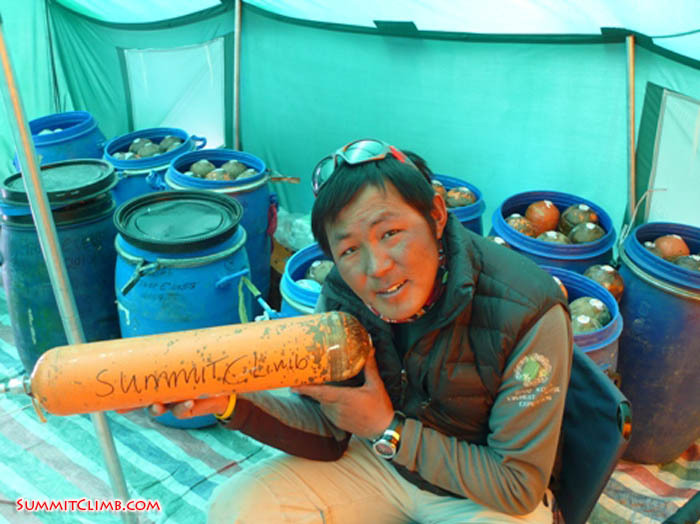 Lobsang showing the fingers he lost on Everest summit in 2006. What a tragedy (Dan Mazur). 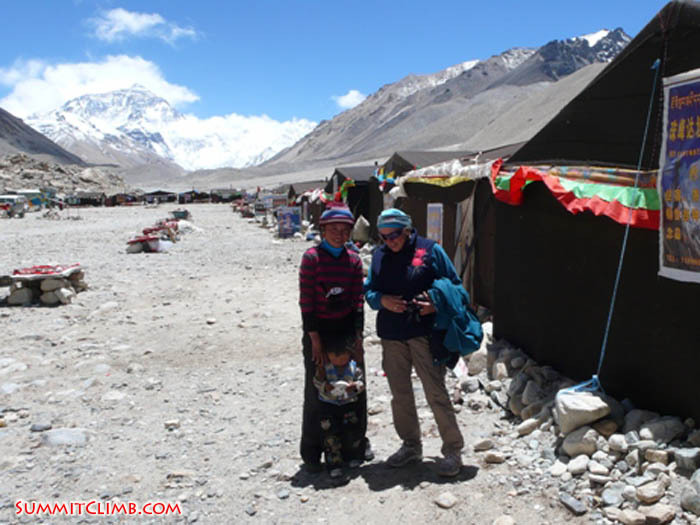 Hi, this is Elizabeth Tertil calling in a dispatch from advanced basecamp for the days of 27-28 April for the SummitClimb Everest Tibet expedition. We stayed for 3 days at basecamp, which included showering, laundry, going to the tea houses, catching up on the internet and eating and sleeping a lot. We set off for our 2nd trip up the mountain on Tuesday April 27th. 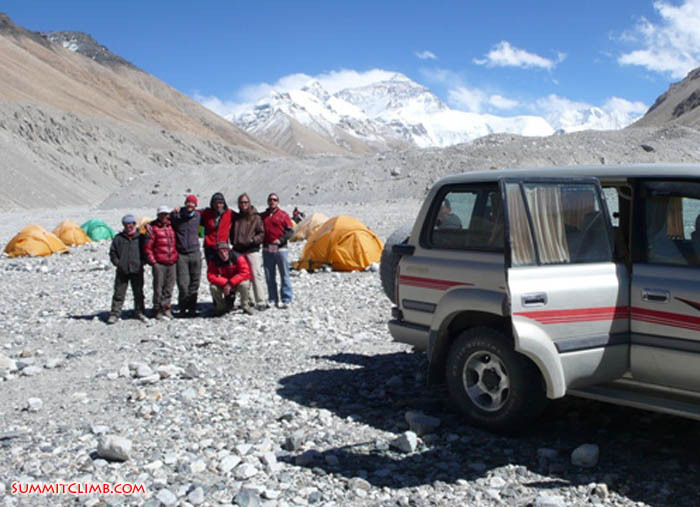 We were all in good spirits enjoying beautiful views of Pumori and the surrounding glacier. We also saw many Himalayan grouse and blue mountain sheep, but no snow leopards yet. We’ll keep looking for them. After a rather chilly night at IBC we had magnificent views of Everest on a very still morning. However, some serious clouds blew in and by the afternoon it was cold, windy and snowing lightly. This did not prevent our having a very pleasant walk among the numerous ice pilgrims on either side of the pass. 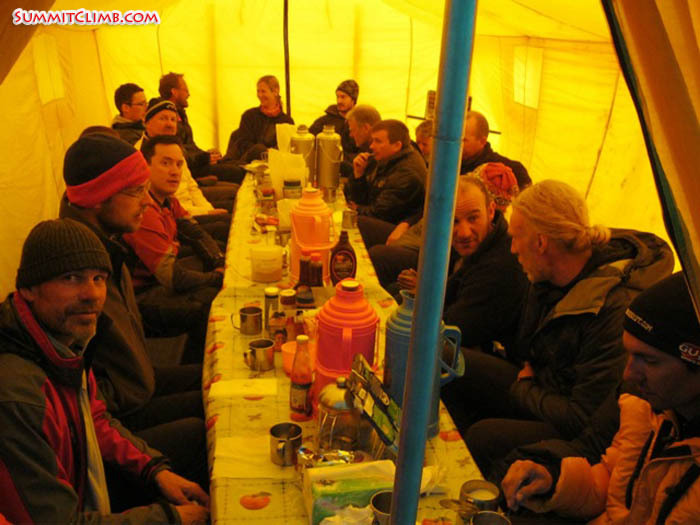 After arrival at ABC, we were greeted with warm drinks and resuscitated with noodle soup. We had a good supper and retired for the night. Last night was crystal clear and cold with a very bright full moon. Thursday April 29th was another beautiful, clear windless morning. 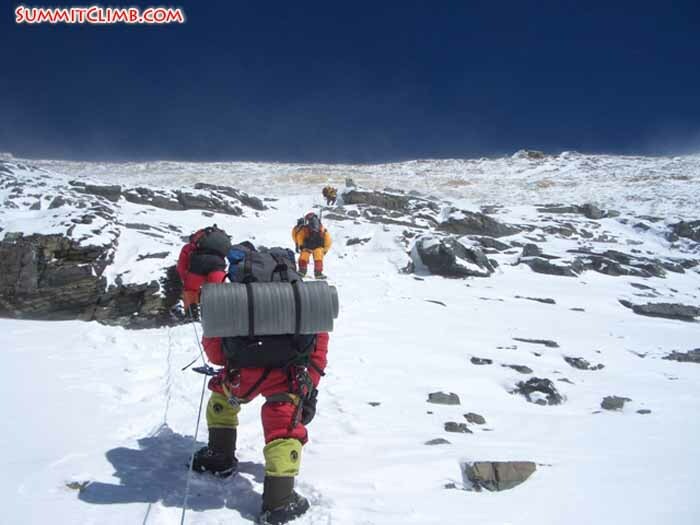 Several of our team members are going to the North Col. The rest will follow tomorrow. 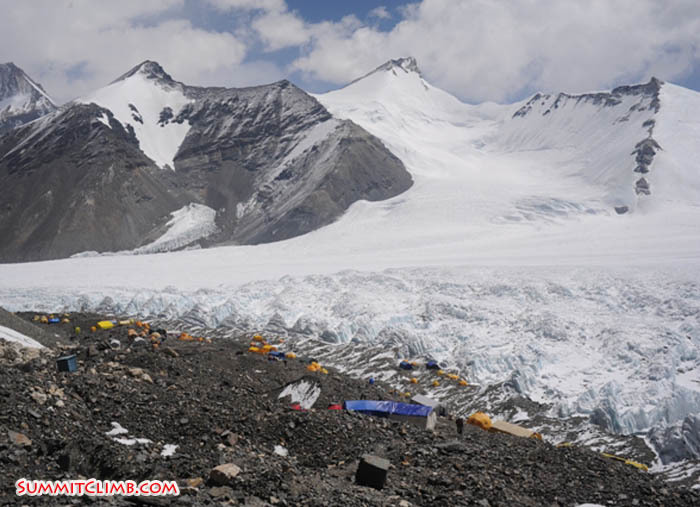 The plan is to spend several nights in camp 1, then go to camp 2 at 7800 metres and perhaps camp 3 at 8300 metres. Peter Kinloch descending the big ladder just below the North col in a bad snowstorm (Frank Irnich). 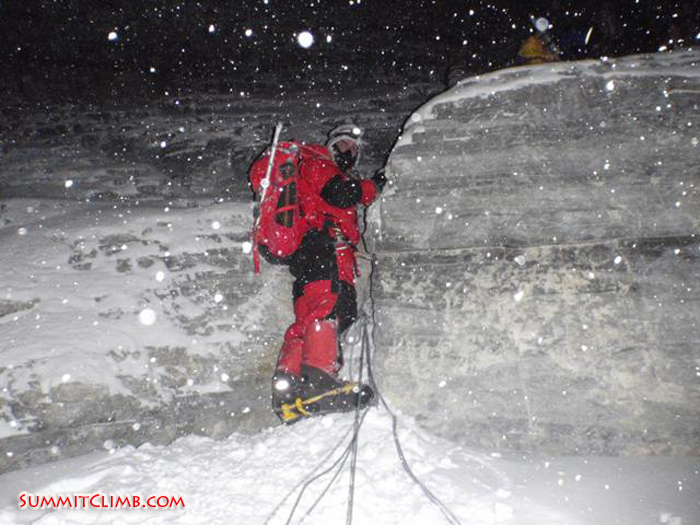 Sherpa team crossing a crevasse we dubbed - 'Nick's crevasse' at around 6800 metres (Frank Irnich). Today began with a lazy, but huge breakfast. Then we checked email and hung out with friends from other teams and told stories, then had a huge delicious lunch of fresh vegetables, potatoes, salad, fresh meat, fresh fruit, cakes, tea, sprite, and coke. 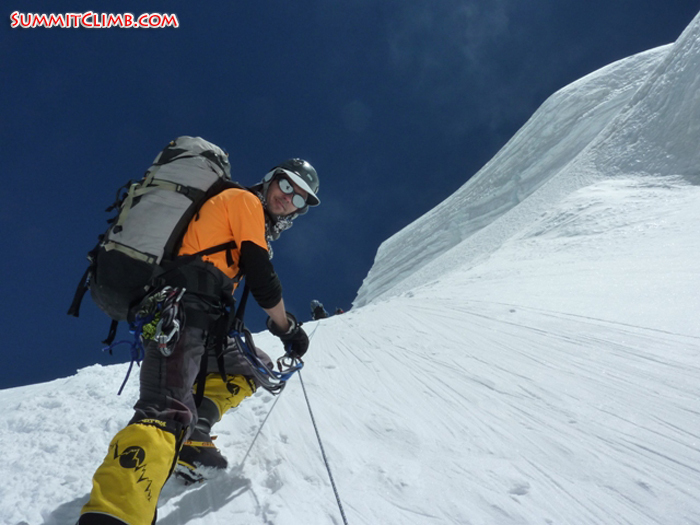 Lakpa Gyeluk Sherpa belays Gordon Hopper across the lone ladder at 6950 metres in the North Col (Chang-La). (Elizabeth Tertil). 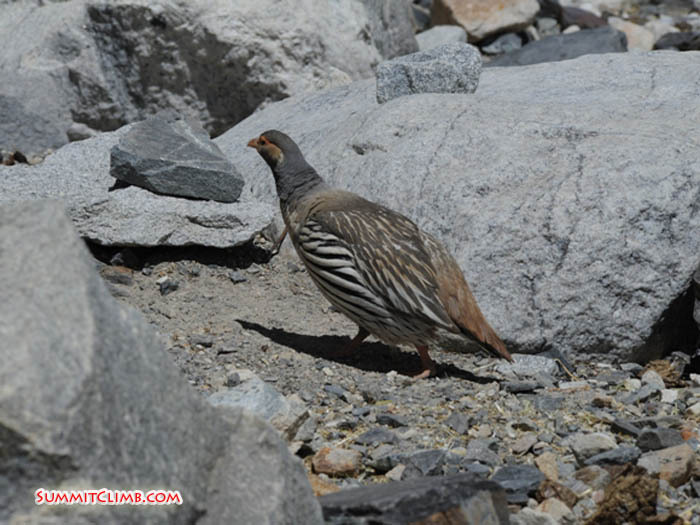 Kongma bird (Himalayan snow pheasant) at 5400 metres by the side of the trail. These birds are protected (Gordon Hopper). Today the team rested in basecamp and it was Anzac day. We payed tribute to the Australia New Zealand Army Corps, may God rest their souls. Team photo taken on 24 April. This was on the occasion of Sri, Roland, and Carl's departure. They will be missed (Frank Irnich). 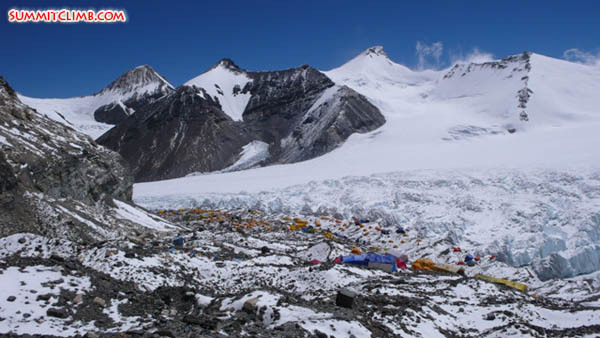 Advanced basecamp at 6397 metres seen from a distance. Oour camp is on the left with a large yellow and adjacent green tent (Gordon Hopper). Thursday 22nd April - After a second windy night up at North Col camp the team was feeling acclimatized and ready to make the journey down to ABC. 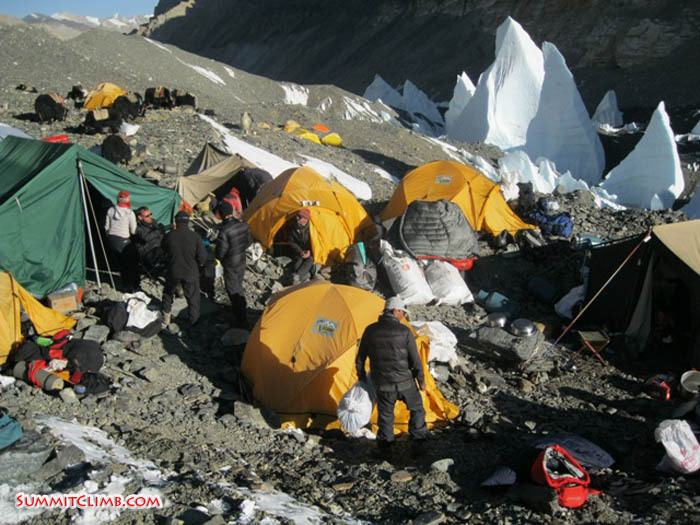 Our sherpas took down much of the camp and some tents were left up and used to cache personal and group equipment in advance of the team's return in a few days' time. 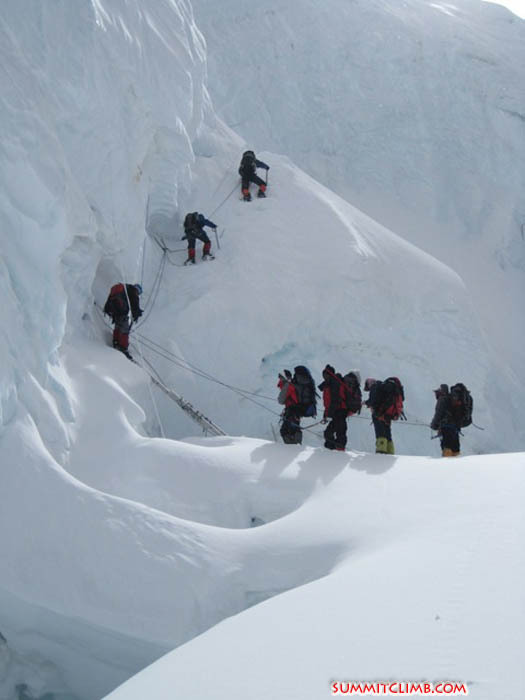 With the gear locked up at the camp the process of descending the fixed ropes of the North Col started at about 09:30. By 12:15 the last team members had left camp on their way towards ABC. 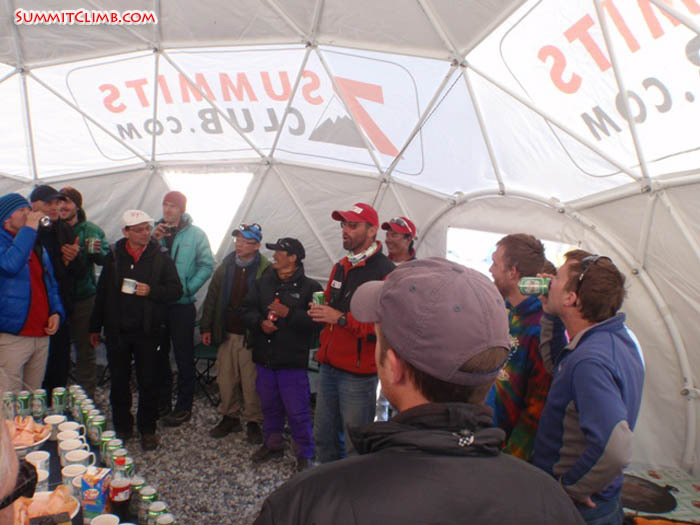 The SummitClimb team had been the first to arrive and stay at the North Col camp and met other teams making their way up the headwall for the first time. The weather was clear allowing for excellent views of Everest. After clearing the famous ladder that covers crevasses at 6950m the team made quick progress and by 15:00 everyone was back at ABC and were rewarded with hamburgers and apple pie by the excellent cooks. Mark, Laval and Gavin decided after lunch to press on to interim base camp, whilst the rest of the team enjoyed a restful afternoon in preparation for a busy day tomorrow. Friday 23rd April - Another windy night in ABC didn't dampen spirits amongst the team. One or two team members were feeling tired but the group on the whole was strong and were looking forward to arriving at base camp for a few days' rest. Despite a little wind the conditions were perfect and with the majority of the team having left ABC by 11:00 it was another great day on Everest with plenty of daylight hours to enjoy the journey to base camp. 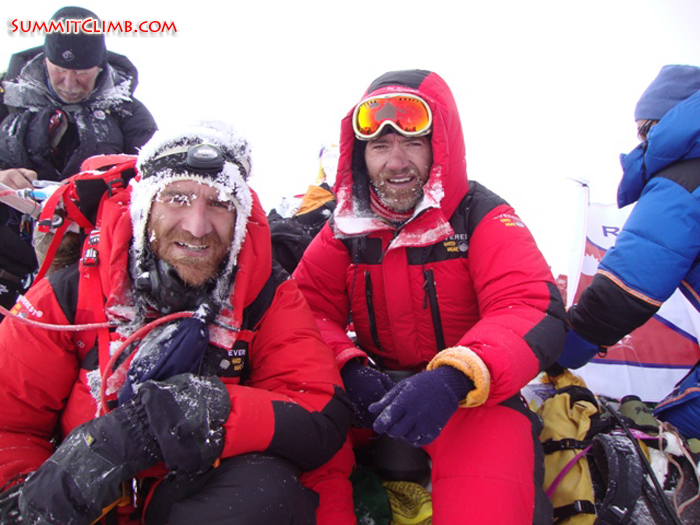 Dan Marino had decided to stay for a rest at ABC today and Mark, Laval, and Gavin completed their shorter journey from interim base camp in the morning. 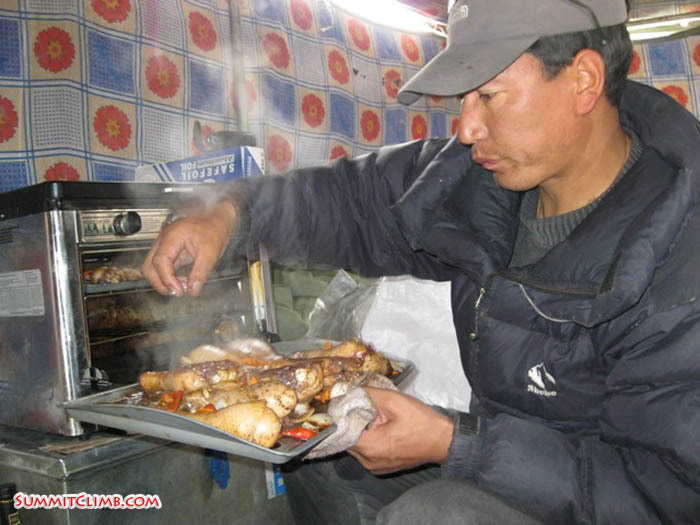 Once again the team's excellent cooks had a surprise waiting for everyone at interim base camp. 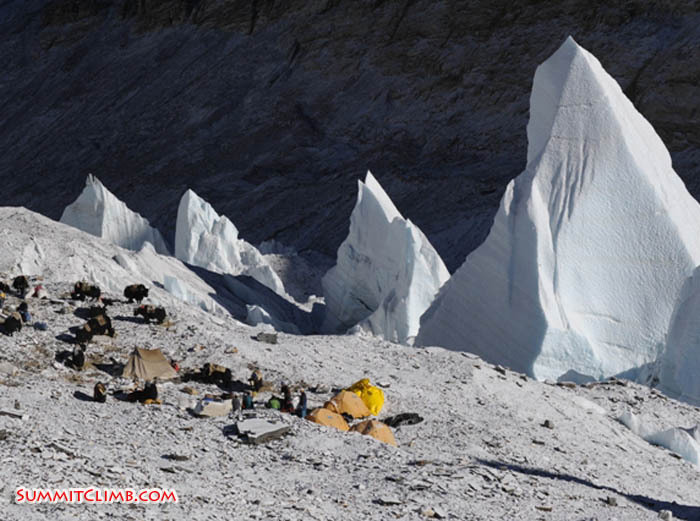 After traversing past incredible ice pinnacles a huge lunch at interim base camp allowed the group to digest the magnificent views they had enjoyed on the first leg of the journey. On the way down from interim base camp everyone was able to enjoy close up views of Himalayan Grouse as they ran across the path and provided entertainment for the team members. Since last following the path up to ABC the glaciers have started to melt ensuring that the views of the route had changed significantly in the past week. Between 17:00 and 19:30 the team arrived at base camp and were able to enjoy the luxurious surroundings they had left a week earlier. 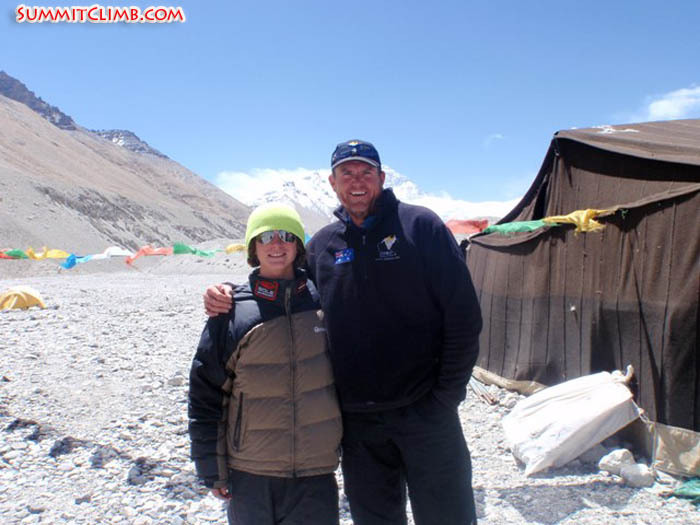 Saturday 24th April - Despite a windy night the team slept very well at the lower altitude of 5200m. Today was the first full rest day and after a huge breakfast the process of washing clothes, resting weary feet, reading, listening to music, eating, rehydrating and joking with teammates began. Behind the tents Everest could be seen in all its beauty whilst the relative quiet at base camp ensured that the team was able to enjoy a good rest. Today was also the day that the group said farewell to Sri, Roland and Carl, who would be travelling home after their involvement in the Everest Tibet expedition came to an end. It was sad to see the three team members leave and their presence will be missed for the remainder of the expedition. The whole team ensured that they received a fitting send off and we hope to meet up with our friends again in the future. Later in the afternoon Dan Marino arrived at base camp, feeling well and ready to enjoy his rest period too. During the evening time, with temperatures in the dining tent falling, David and Laval developed an ingenious counter-balance door system that performed brilliantly to keep the heat in and was met with rapturous applause from the rest of the team! Once again the cooks excelled themselves and the team settled down to enjoy another night of deep sleep! Ice climbing practice at ABC (Sri Llakshmi Sharma with Peter Kinloch's camera). Sherpa team carrying our high altitude kitchen on the face of the Chang-la (North-Col) at 6700 metres, on the way to camp 1 (Fikret (Fiko) Karacic). 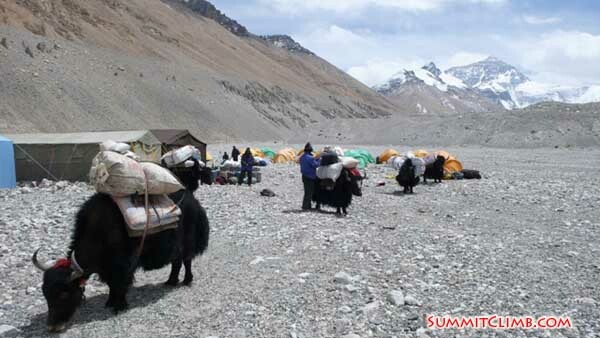 Hi this is a dispatch for the SummitClimb Everest Tibet expedition. The time is 7:15 p.m., local Tibet time. I’m calling you from the top of the North Col. The elevation is about 7000 metres/23,000 feet up here. The North Col is also known as the Chang La. Today we got up and had breakfast made by our amazing cook up here on the North Col, Kipa Sherpa. 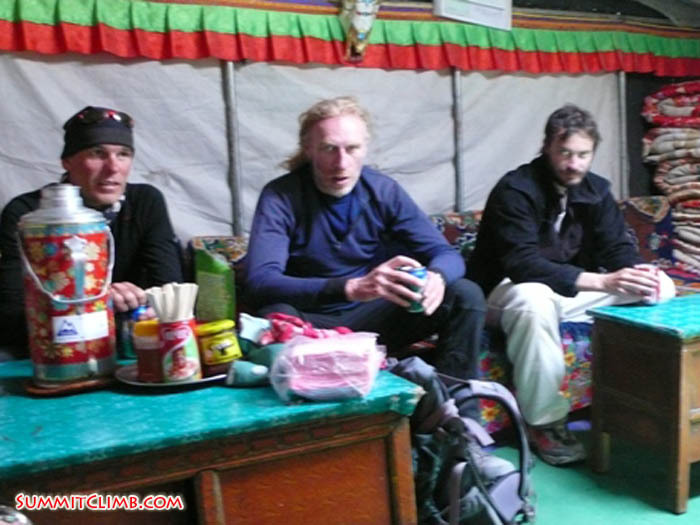 Everybody had kind of a rough first night up here at 7000 metres, which was to be expected. Then we kind of greeted the sun and stretched our legs a bit. It was really windy last night. We talked to ABC on the radio and heard it was super windy down there. Our big dining tent was partially blown down. We need to go look at that, but they were able to repair it, so that’s good. After a delicious lunch a group of members decided they were ready to go down and that one night was enough for them. That was Roland, Sri and the 2 brothers led by our amazing Chinese guide, Asu. A group of us hiked up towards camp 2 to check out the route. It was super windy up there. It was really quite amazing conditions with the high winds and we had to wear our down suits. 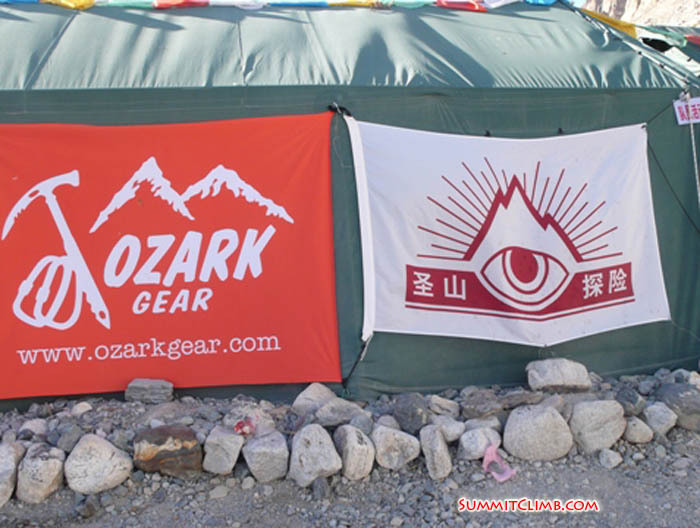 Meanwhile, our sherpas who are with us strung up a bunch of prayer flags all over the camp. I just wanted to let you know that we’re the only team up here on the North Col. I don’t know where everybody is, but we’re the only team. Tomorrow we’re headed back down to ABC. Then we’ll go back down to basecamp for a couple days of well deserved rest after this acclimatization mission. 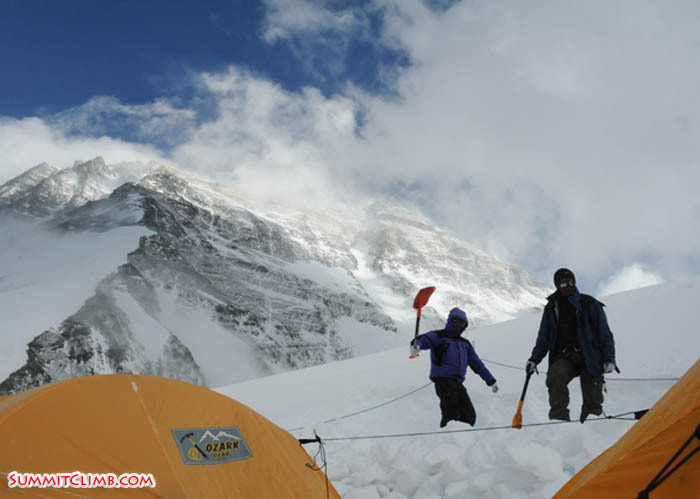 Sherpa team digging tent platforms on the North-col (Chang-la) at 7000 metre high camp 1 (Fikret (Fiko) Karacic). 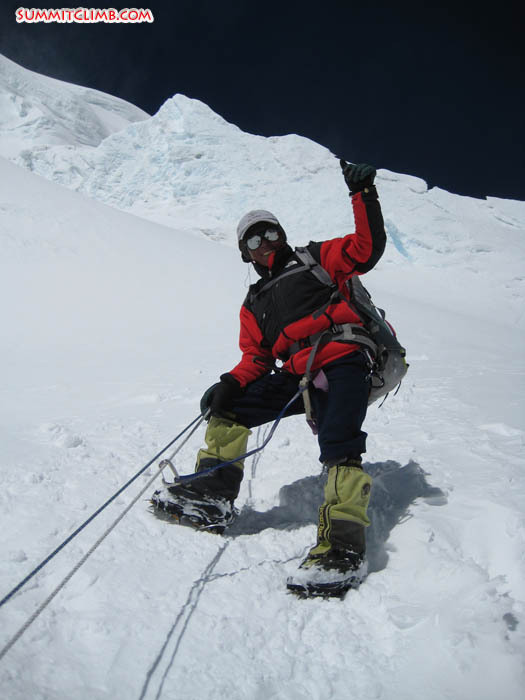 Team member Fiko at 6900 metres on the Nnorth-col (Chang-la) face, traversing a crevassed section, on the way to camp 1 (Gordon Hopper). Hi this is Tom Javrin calling in for the SummitClimb North Col 2010 trip. I’m leaving my report now because I’m heading down from ABC to basecamp. I left the group about 6 days ago to do an accelerated acclimatization due to me needing to get a flight home to the UK on the 18th. 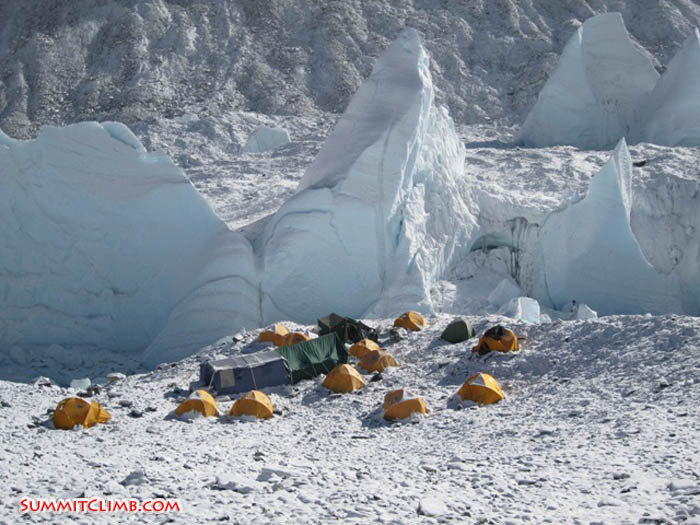 It was quite hard work to acclimatize with 2 days in each camp. Yesterday the goal was to get up to the North Col and back with Jimpa and Thile, my 2 sherpas. We managed to do it, so that was a fantastic ending for me on this trip and personally a really great achievement. 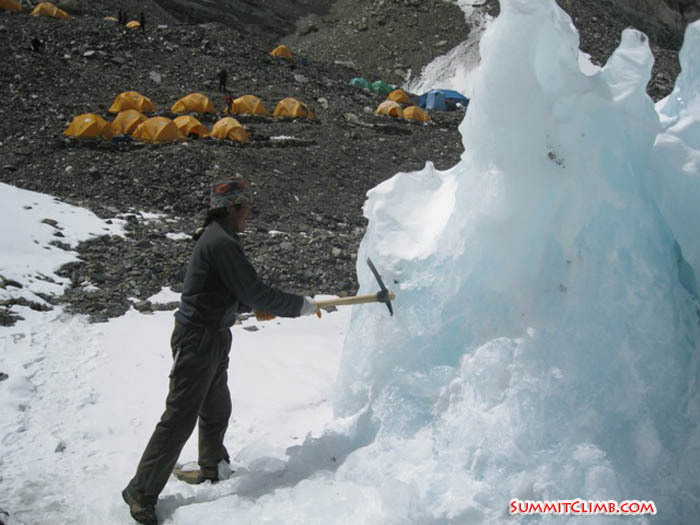 Norbu from Chun Zom cutting glacial ice to be melted into drinking water in 6400 metre ABC (Samdien). 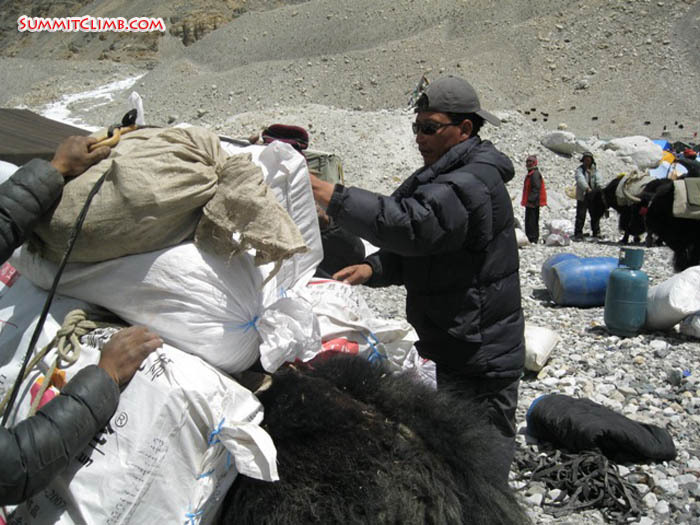 Samdien and Norbu loading rice sacks with ice chunks to be carried over to the ABC kitchen.Personal water bottles awaiting filling from group thermos flasks in the mammoth daily task of keeping the team hydrated at 6400 metre ABC. Team in heated ABC dining tent before breakfast (Samdien). Nepal side trek group enjoys breakfast at Hotel Tibet before departure (Dan Mazur). Today all of our Nepal side expeditions and treks went to the Ktm airport. 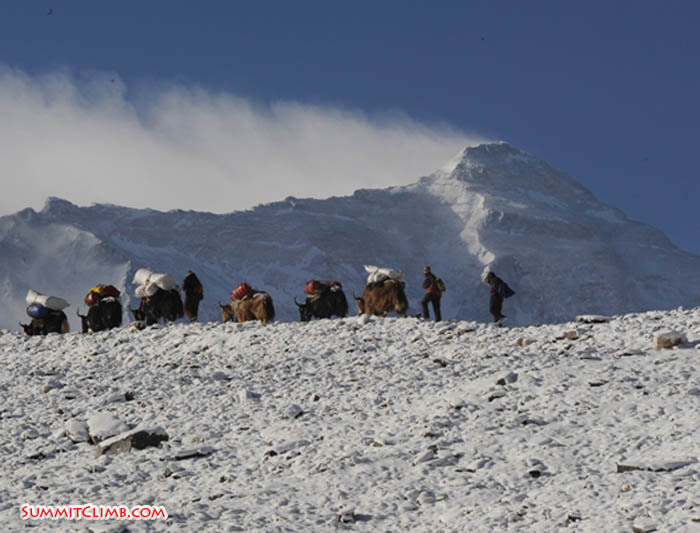 The climbers were successful and arrived in Lukla and trekked to Phakding. Gavin wearing his sponsors logo shirt at Flavours Cafe in Boudhnath after Puja ceremony to get our prayer flags based by the high lama. 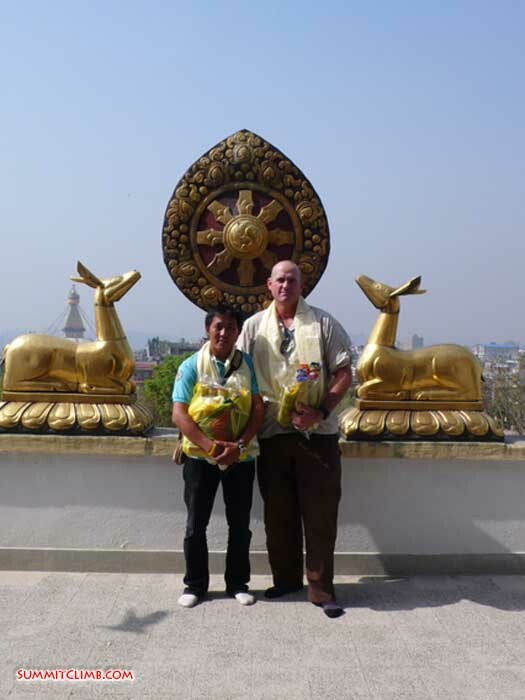 Jimpa Sherpa and Gavin after the prayer flag ceremony on the roof of the Gompa (Dan Mazur). Blessing ceremony for our prayer flags at the monastery. 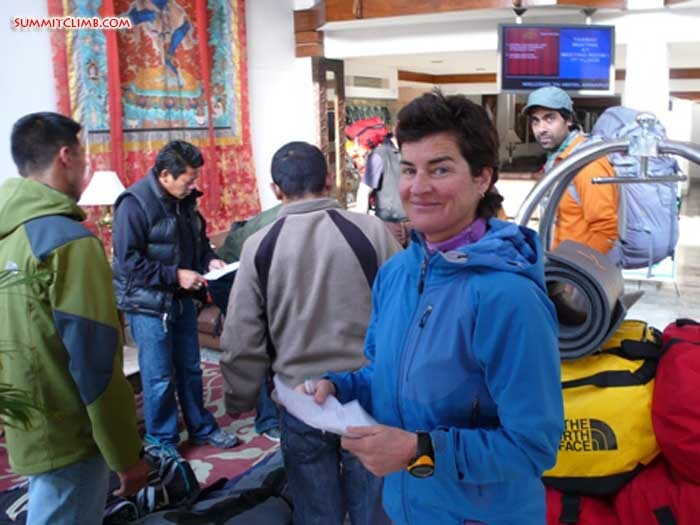 Josette checks Nepal side teams luggage at the Annapurna Hotel prior to departure (Dan Mazur). Left to right- team leaders Raj, Jjosette, Max preparing the 5 satellite phones our teams will use this spring climbing season (Dan Mazur).